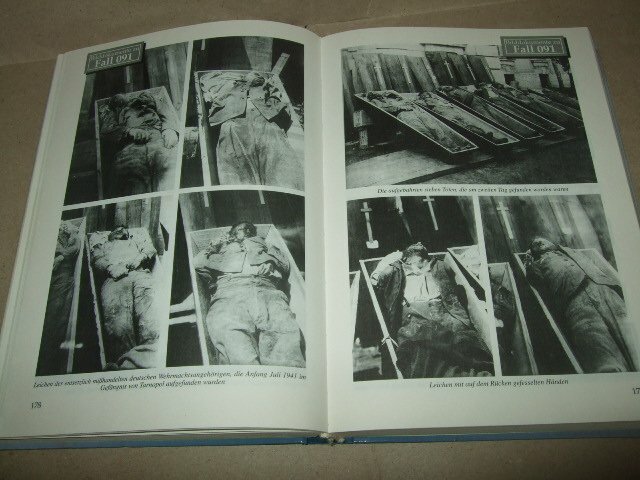 The photos that Mattogno refers to he looked up in online photo archives (mostly The Ghetto Fighters’ House and Yad Vashem, on one occasion the USHMM), which raises the question whence Mattogno drew the assumption that all or most photos of Nazi mobile killing operations are available on the internet. Even in our digital age that is hardly a given, and I have been shown numerous photos of killing sites in the former Soviet Union that are not on the web. But that’s a secondary issue. 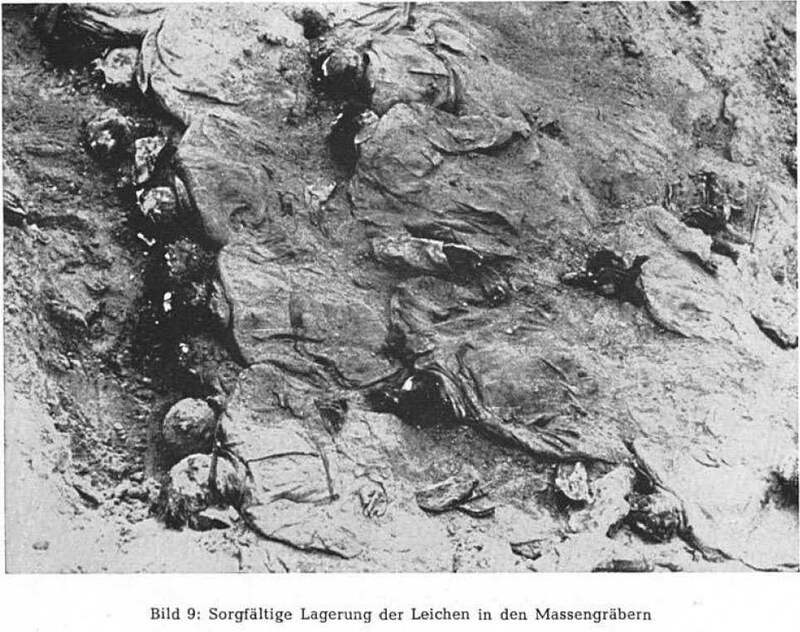 The main issue with Mattogno’s above-quoted statement and the ensuing list of discrepancies between reported victim numbers and "shown" corpses is Mattogno’s argument that, if the mentioned figures were realistic, they would be "confirmed by hundreds of photographs of mass graves and of exhumations taken by the various warcrimes commissions, and showing hundreds of thousands of bodies." 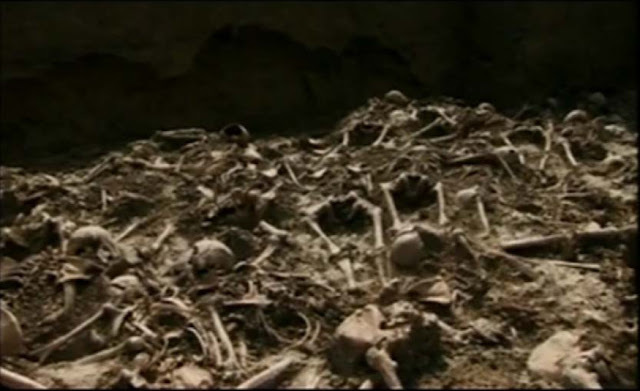 Hundreds of photographs of mass graves, showing "hundreds of thousands of bodies" – is this a reasonable expectation, or is it just another case of Mattogno’s not knowing what he’s talking about or expecting his readers to be ignorant and gullible enough to fall for what he tells them? Let’s look at a few photographs that show a number of bodies about as huge as permitted by the photographers’ vantage point and the eye of their cameras. The first photo is from the Yad Vashem archives. 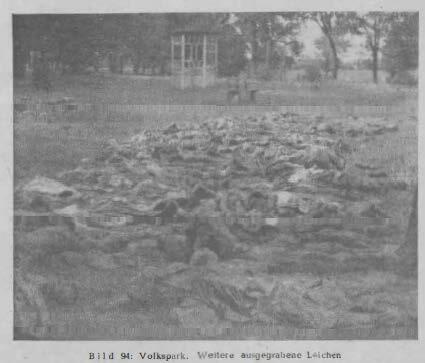 It was in all probability taken in a camp for Soviet prisoners of war and is captioned "Latvia, A pile of about 4000 victims' dead bodies." Does anybody count 4,000 bodies on this photograph? I don’t. 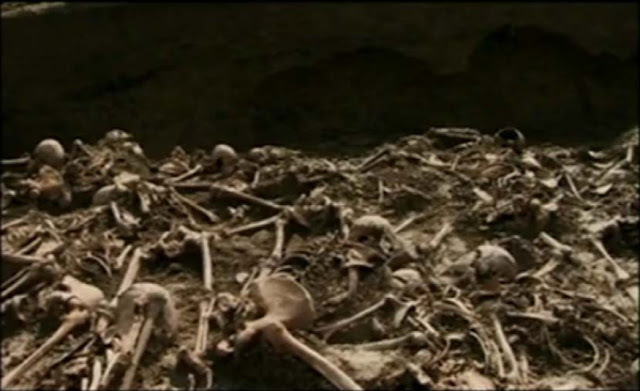 A rough count of the viewable corpses (as opposed to those that may be hidden from view by corpses lying above them) yields about 250 corpses. Let’s make that 300 for good measure, even though I consider this number too high. The number of Soviet prisoners of war who perished in German captivity is about 3 million, an order of magnitude that is well supported by documentary evidence. 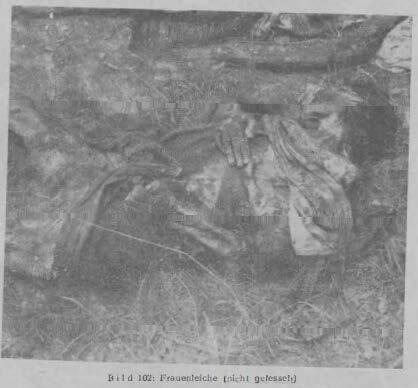 Assuming the largest number of corpses on the photograph considered above, it would take 10,000 such photographs, with no two photographs showing the same corpses, to photographically document all Soviet PoWs who died in German captivity. 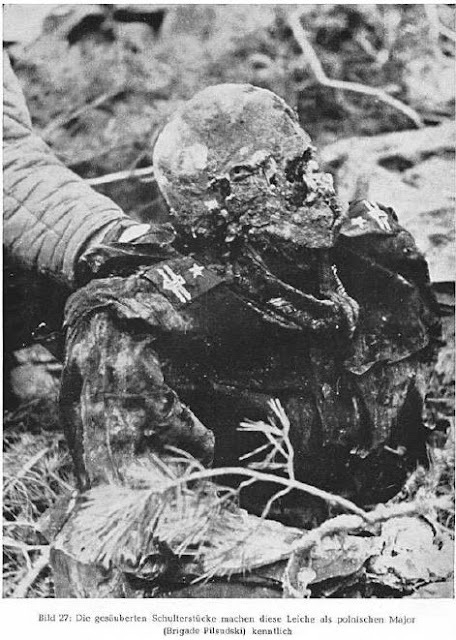 The number of published photographs showing dead Soviet PoWs is but a small fraction of that. No such photo that I have seen shows as many corpses as the one above. Is that supposed to mean that one should call into question the well-documented order of magnitude of the Soviet PoW’s mortality? 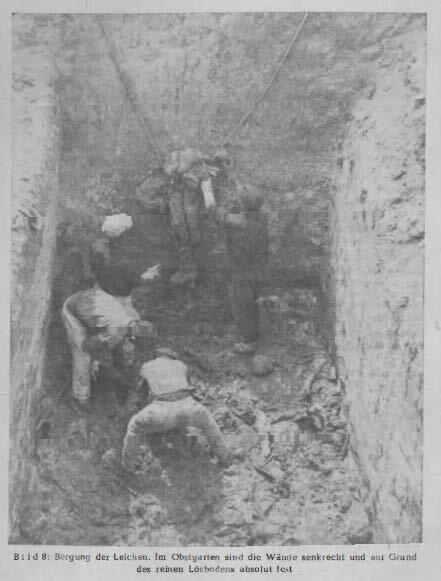 The next four photos are closer to our subject of mobile killing operations, as they show mass graves containing naked execution victims. 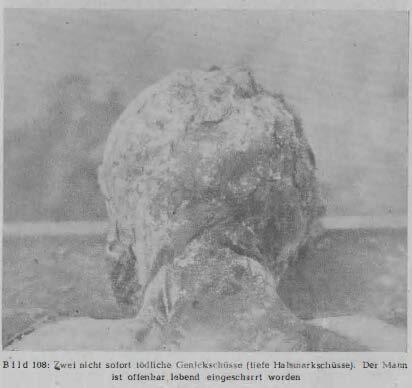 The upper photo obviously shows only a part of the grave by which it was taken, and the number of corpses in view (which occupy nearly all of the photo) is in the order of 100 by my estimate. 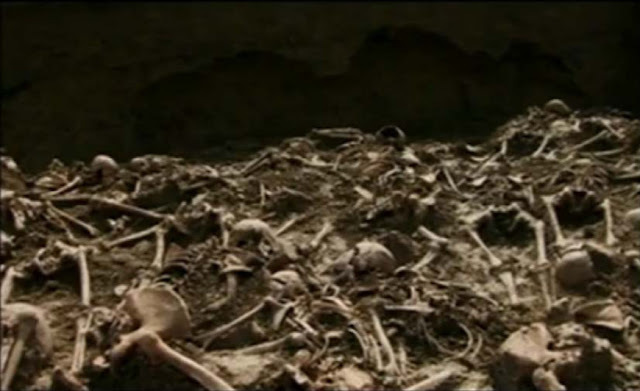 There are obviously further corpses lying below these, which however are not visible to the viewer. 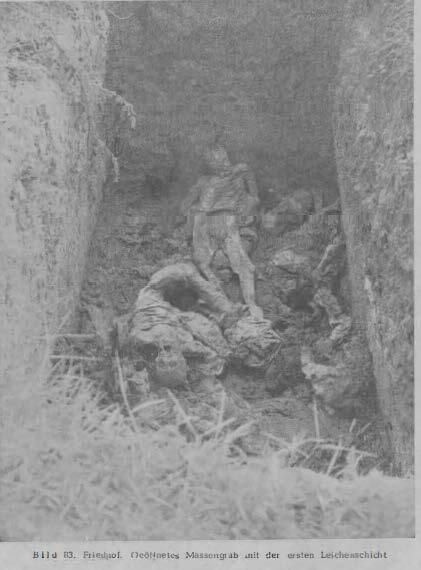 So a total of about 260 corpses can be seen on what are arguably the four photographs showing the largest number of people murdered in mobile killing operations – 65 per photo. 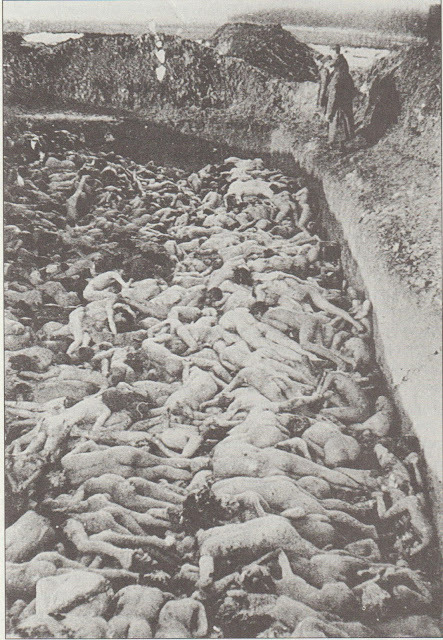 The total number of Jews killed in mass executions by the Nazis is currently estimated by historians at about 2 – 2.2 million. 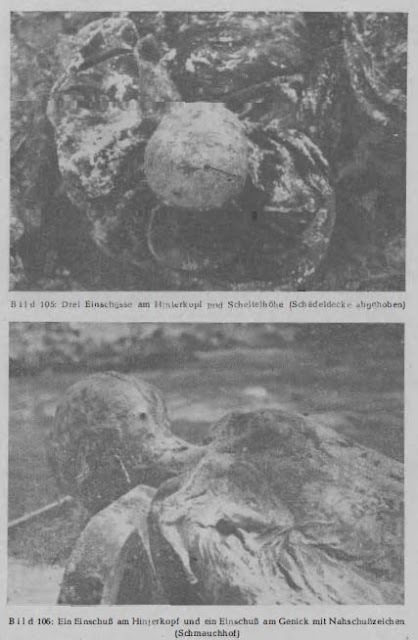 Photographically showing about 100,000 corpses (nearest lower round number is 99,970) would require no less than 1,538 such photographs, provided that no two photographs show the same corpses. Photographically showing about 2 million corpses (nearest lower round number is 1,999,400) would require no less than 30,760 photographs, the same condition (no two photographs showing the same corpses) provided. So expecting to see hundreds of thousands of bodies on "hundreds of photographs of mass graves and of exhumations" is obviously far off the mark of reasonability. Now, how reasonable is it to expect photographs adding up to, say, 100,000 corpses, regarding any given mass crime? 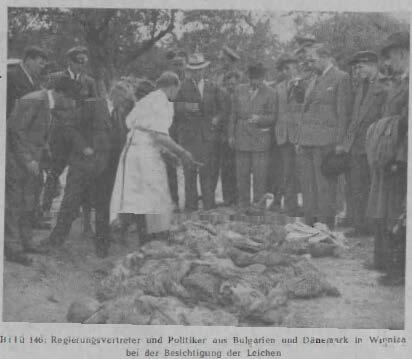 It would be possible to take the required number of photographs after all corpses have been lined up side by side (an enormous task, to say the least), but where and by whom has anything like that ever been undertaken? 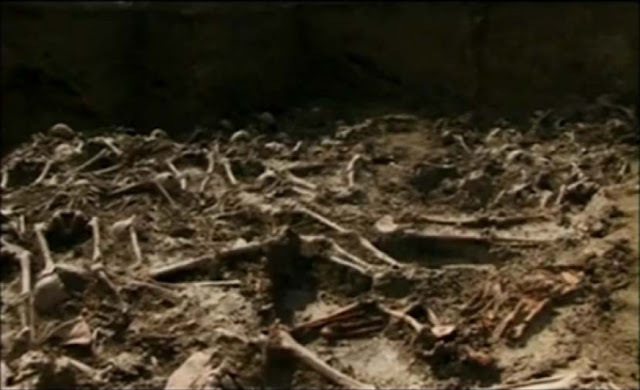 Who has ever undertaken to show all corpses of a massacre site investigation, especially one involving tens or hundreds or thousands of corpses, on publicly available photographs or film footage? 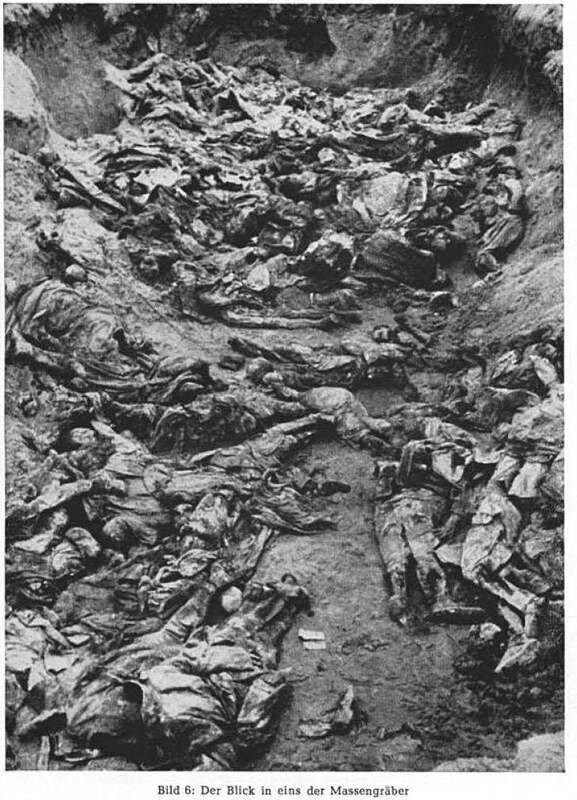 Let’s look at the 1943 investigation of the Soviet mass killings at Katyn by Nazi Germany, which is upheld by "Revisionists" as a model of mass crime investigation and documentation. A public report about this investigation has 331 pages and includes 73 photographs. 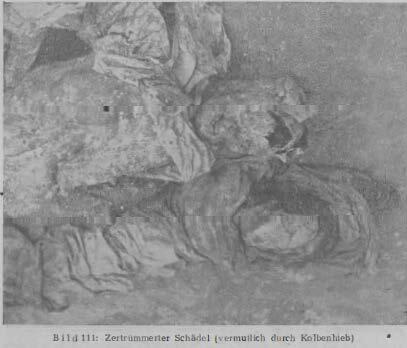 Those among these photographs that show corpses or parts of corpses are reproduced below (needless to say, the images are very graphic). How many corpses does one see on these pictures? 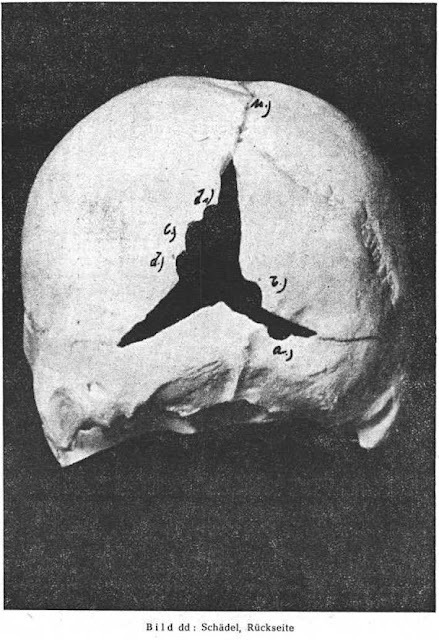 The first 11 pictures are various views of the skull of a single dissected corpse, corpse no. 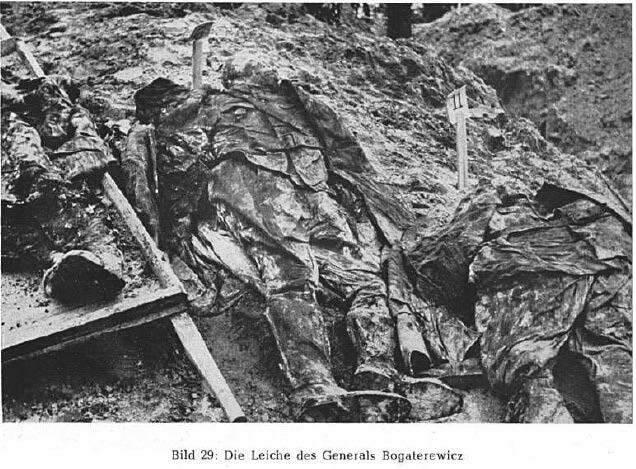 0833, a Polish first lieutenant who had not yet been identified. 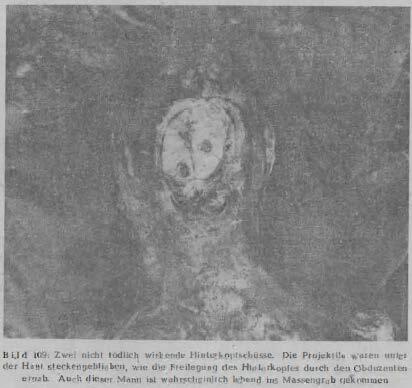 On the other 27 pictures (out of 57 in the picture essay at the report’s end), assuming that no two pictures show the same corpses (which is hardly certain), one can make out, by my rough and possibly generous count, about 430 corpses, slightly more than 10 % of the corpses exhumed. 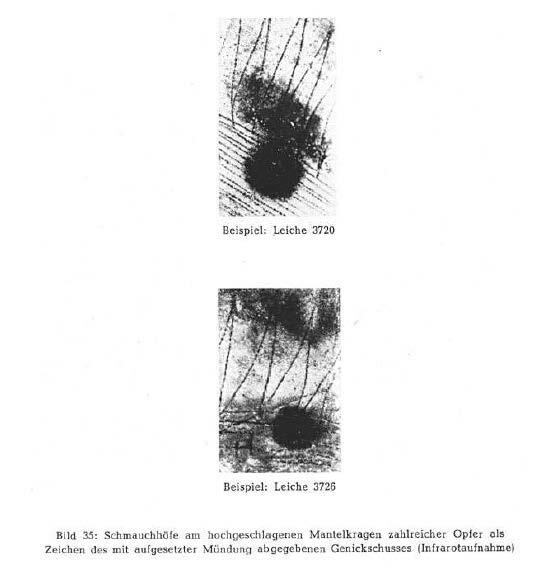 The pictures show that the report’s emphasis was not on documenting the quantity but rather the quality of the killing – the manner in which the victims had been shot and the trajectories the bullets had taken, the victims’ bound hands, the aspect of the most prominent among the officers killed. 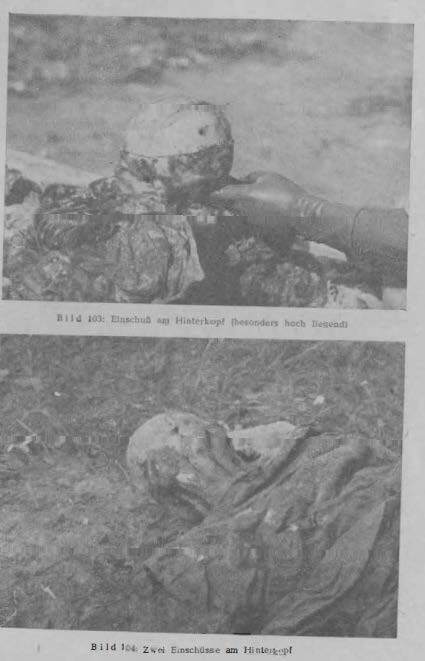 Pages with pictures showing corpses make up little more than 10 % of the report. 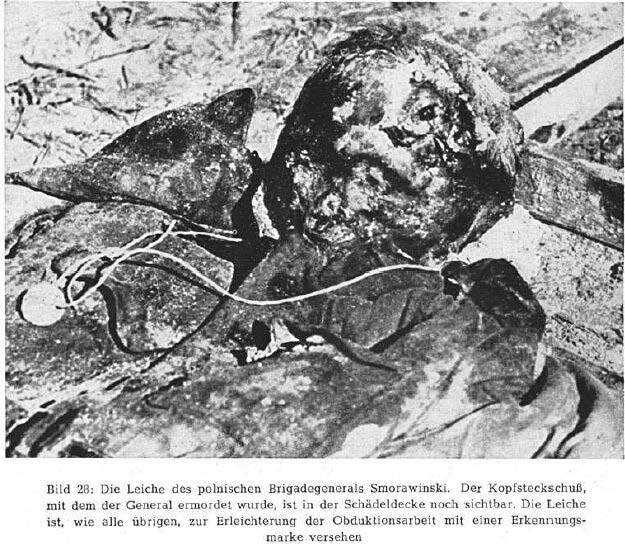 The investigation of the Katyn killings by Nazi Germany stands head and shoulders about any Soviet investigation of German crimes that I know of (which is one of the reasons why Soviet investigation reports should not be accepted at face value but checked whenever possible against evidence uninfluenced by the Soviets, such as German documents and testimonies before criminal justice authorities of the German Federal Republic). 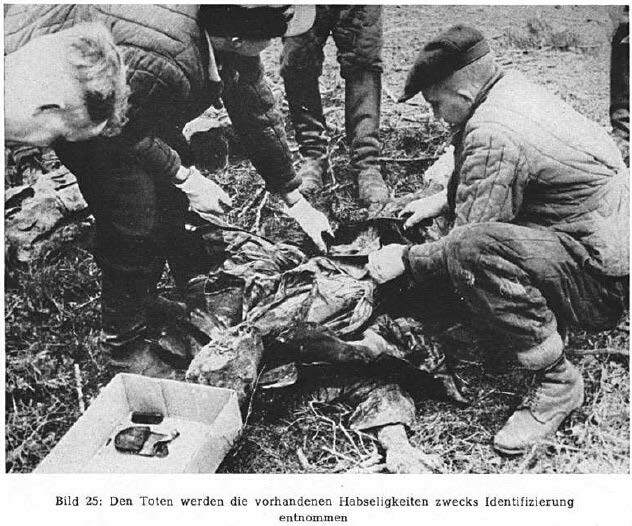 Yet the Nazi investigators obviously did not consider it their task to document the scale of the killing by photographic evidence. They used photos as illustrations of what becomes apparent from other evidence, meant to help convey the quality rather than the quantity of the crime. 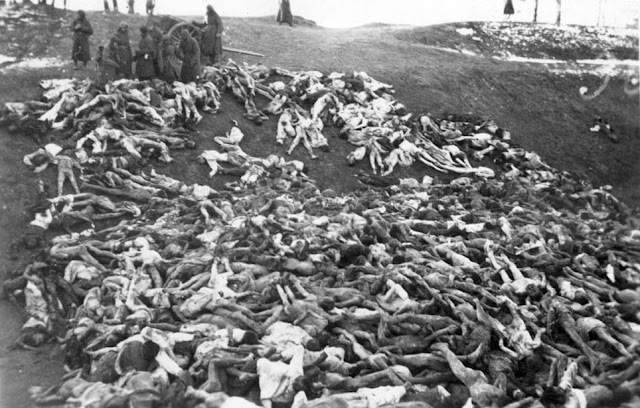 There is also a short documentary film made by the Nazis, in which it is claimed that 12,000 Poles had been killed at Katyn. While the footage also shows several hundred corpses (again, assuming that no two sequences show the same corpses), the makers obviously considered other images more telling – close-ups of individual corpses, personal photographs found on the bodies showing their loved ones (the commentator remarks that one can only look with commotion at these pictures full of life found on the dead). 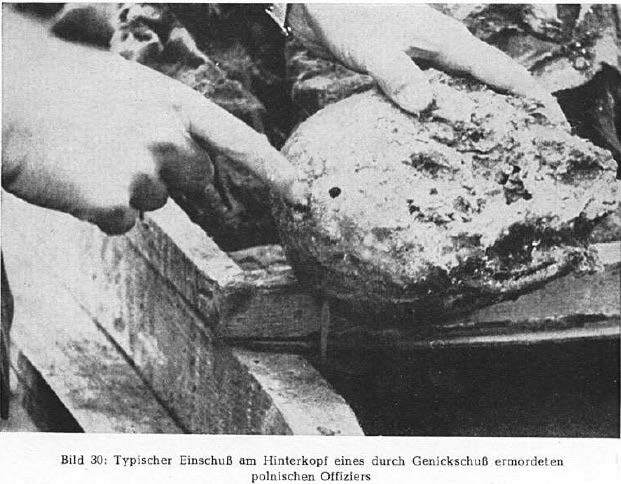 It would take about 240 reports like Nazi Germany’s Amtliches Material zum Massenmord von Katyn, and over 2,300 picture essays like that contained in this report, to forensically/photographically document the over 1 million people executed by Stalin’s regime, 30 or more times as many for the "tens of millions" of Soviet murder victims (moreover up to 1941) that Mattogno’s editor Germar Rudolf believes or professes to believe in. But there are just a few. 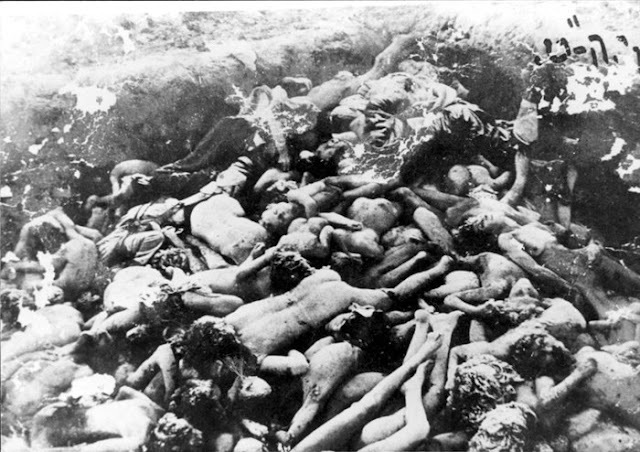 Another Nazi investigation of a Soviet mass killing, which got much less publicity than the Katyn investigation, was conducted regarding the Vinnytsia massacre, which was part of the Great Purge. Unlike at Katyn, most of the 9,432 victims exhumed could not be identified. 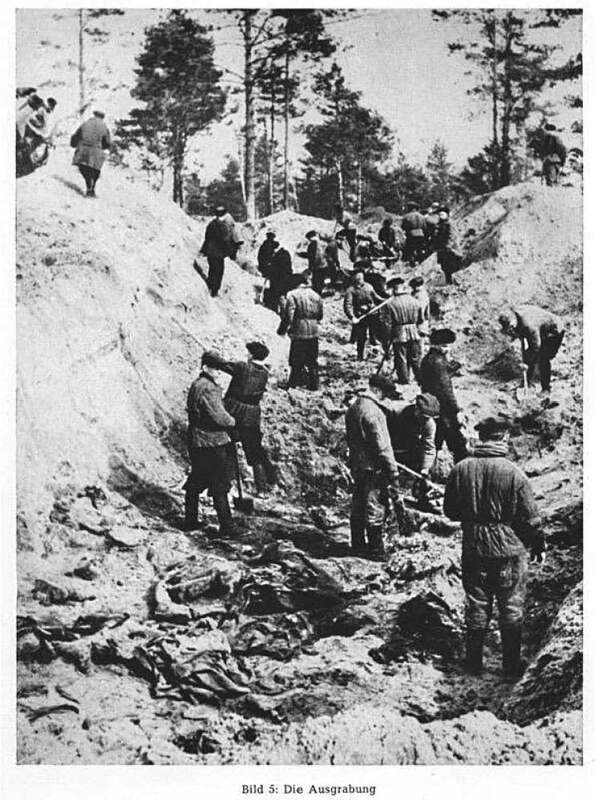 The investigation report is just a little shorter than the Katyn report, and the photographic documentation shows a much smaller proportion of the victims. Some of that documentation is reproduced below. 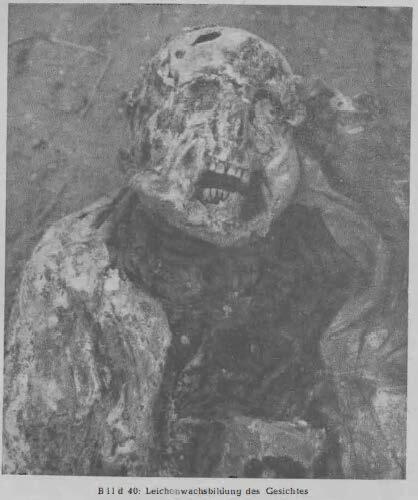 In order to avoid saturating the reader with grisly pictures, I have in this case omitted most of those photos that are meant to illustrate the forensic examination of individual corpses, which make up the majority of images in the Vinnitsya report. 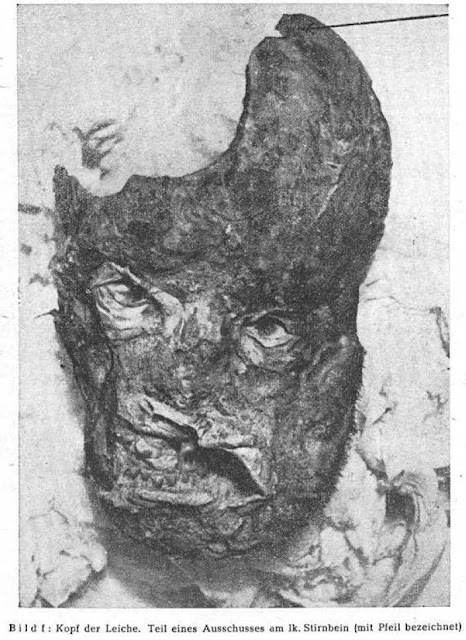 A collection showing all pictures of corpses or parts of corpses is available here. 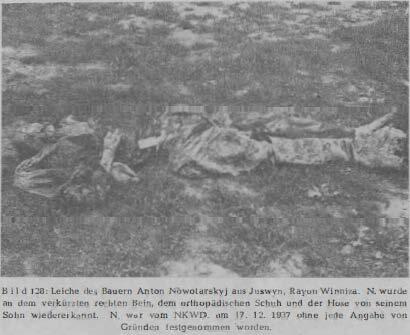 As in the case Katyn, the photographs show the investigators’ focus on photographically documenting the qualitative features of the crime (e.g. 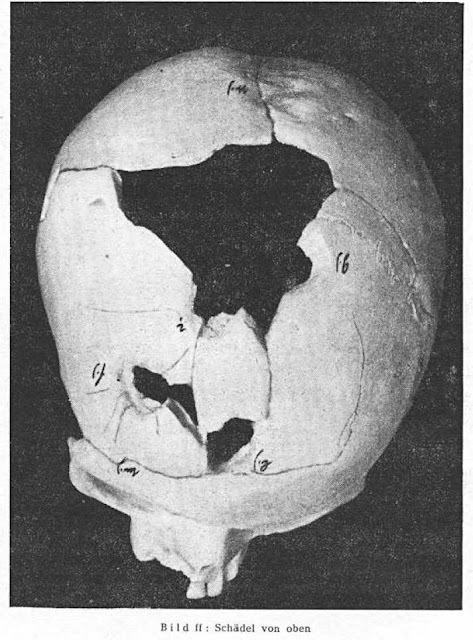 that the killing was done with small-caliber weapons, bullets fired at the head sometimes didn’t penetrate the skull and victims were finished off with blows from rifle butts, or that victims had had their hands and/or legs tied), and not the magnitude thereof. 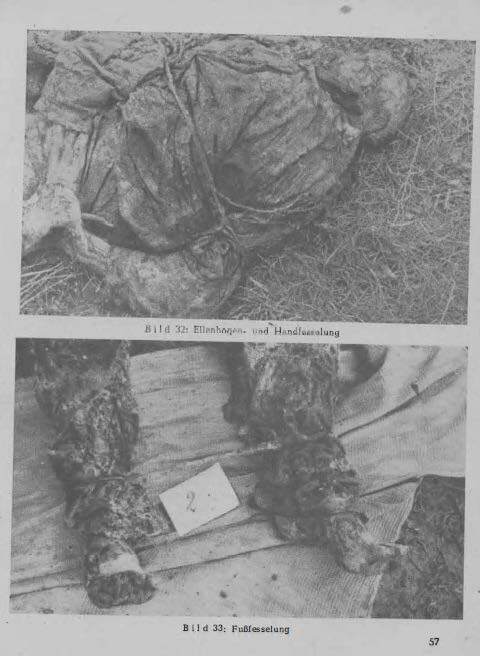 Then there are photos of war crimes, gory images of German soldiers murdered after being captured by Soviet troops or partisans, like the ones reproduced below. 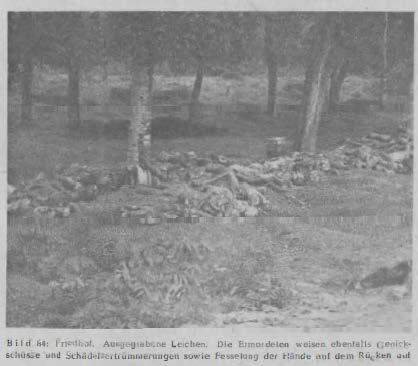 Again, these images show but a tiny fraction of the hundreds of thousands of German PoWs who died in Soviet captivity (overwhelmingly from privation but also, in many cases, from hard violence). What does all this mean? 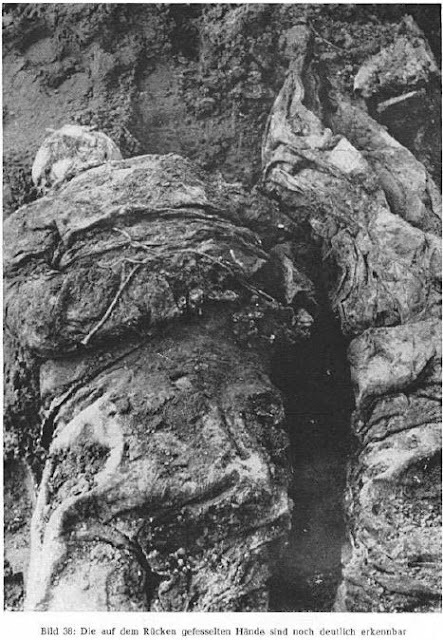 What does the scarcity of photos showing dead victims of Soviet crimes tell us about the magnitude of these crimes? 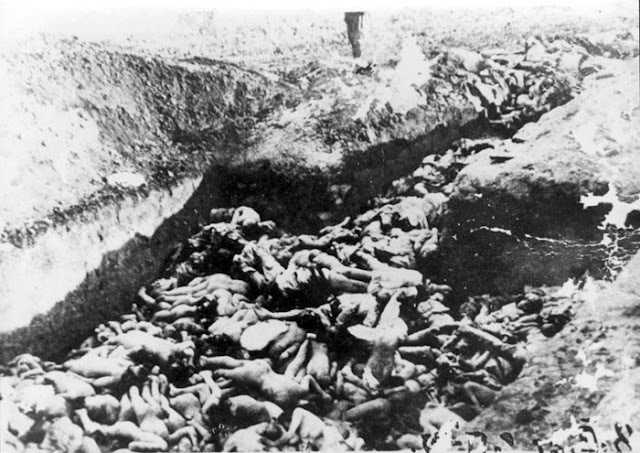 What does it matter to the historical record of these crimes how many dead bodies one can see on such photographs? It matters nothing at all. 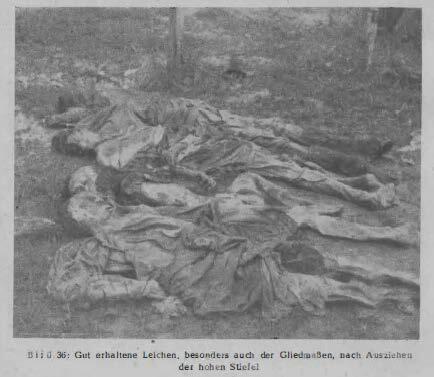 Just like the comparative abundance of dead bodies visible on published photographs of Nazi crimes tells us nothing at all about the magnitude of Nazi crimes inside and outside of camps. Photographs or film footage show but a minuscule fraction of the about 9 million non-combatants killed by agencies of Stalin’s regime through executions, wanton atrocities, famine and hardship in labor camps and exile colonies. 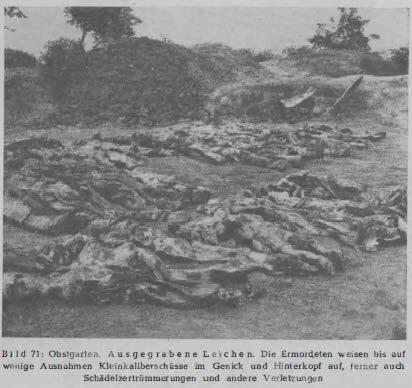 Photographs of film footage show but a minuscule fraction of the about 6 million victims of hard criminal violence by Nazi Germany or the about equal number of non-combatants that the Nazis killed by exposing them to extreme privation. So what? The evidence that all these people died is conclusive regardless of how many or how few of them were photographed or filmed after death. Whoever invokes scarcity of photographs to call Nazi mass killings into question might at least as well argue against the factuality of crimes committed in and by Stalin’s Soviet Union. 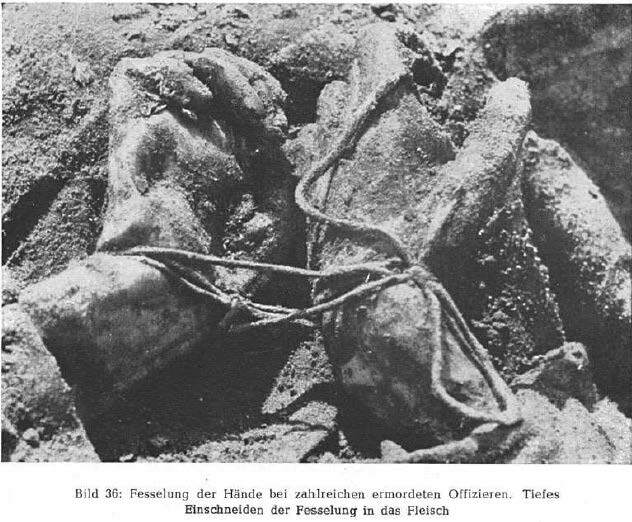 One might object to the above that published photos of Nazi crimes are more numerous than such of Soviet crimes, and should furthermore be more numerous than they are, because Nazi crimes have been investigated and researched far more extensively by judicial authorities and others who had unhindered access to the crime sites, while the same does not apply to most Soviet crime sites. Would this be an argument worth considering? To answer this question, let’s have a look at the two largest mass killings that took place after World War II. 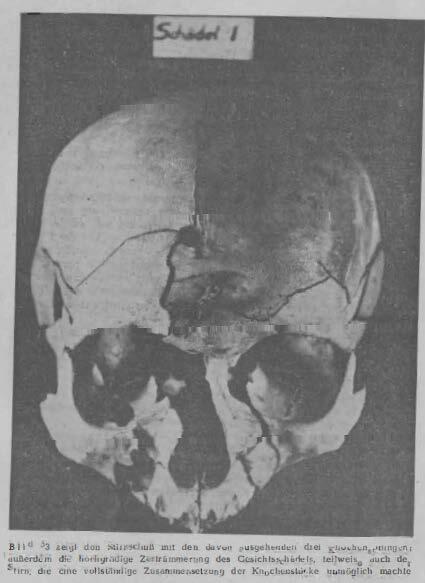 These happened at a time when visual means of information were more developed and widely used than they had been in the 1940s, and the killing sites have been exhaustively examined. I’m referring to the Cambodian genocide of 1975-79 and the Rwandan genocide of 1994. So how many of these victims can be seen on publicly available photographs? The DC-Cam’s website includes a photo archive. On the entry page it is mentioned that DC-Cam has about 6,000 photographs in its possession. Most of these seem to be photographs of prisoners from Tuol Sleng (S-21) prison in Phnom Penh (presumably "mug shots" taken of prisoners upon entering that prison) and other photographs showing living individuals. There are also very graphic images of torture victims at Tuol Sleng, and there are 274 photos pertaining to the aforementioned PRK investigation. On 119 of these 274 photographs one can make out or possibly make out human remains, almost always skulls and/or bones. Counting dead bodies on hand of bones is difficult unless one is an anatomist (which I am not), but every skull pertains to a human being, so by counting the skulls one can get an idea of how many dead people are shown in each picture. Assuming that no two photos show the same remains (counterfactually, as mounds of skeletons on sequential photographs often look very much alike, and some photos are obviously repeated), the remains visible on these photographs add up to roughly 2,800 dead people, generously (over)counted. Then there are other photos on the internet, mostly taken at the Tuol Sleng and Choeung Ek memorial sites. On 20 of these photographs I counted roughly 3,800 skulls (again, assuming that no two photos show the same skulls),  so that together with the PRK photos we would have about 6,600 skulls of Khmer Rouge victims that can be seen on publicly available photographs. Let’s make that 7,000 for good measure. 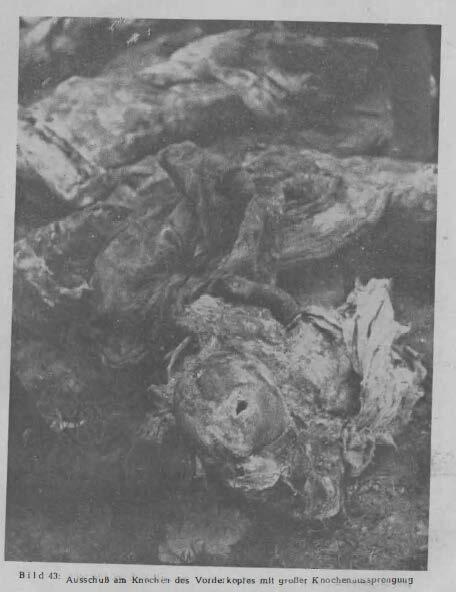 If the photos showed whole bodies instead of skulls and bones the number of dead portrayed would obviously be much lower (one can capture far more skulls than whole bodies on a photo), but even 7,000 is just about 1.23% of the 568,663 dead counted or estimated by the PRK investigators based on exhumations, 0.50% of the 1,386,734 dead in mass graves estimated by the DC-Cam and 0.35 % of the about 2 million victims of the Khmer Rouge regime in 1975-79 (i.e. it would take 28,571 such photographs to photographically document the whole genocide). If my skull count were corrected for repetitions and multiple counts, the proportions would be even lower. Obviously nobody had the intention of documenting, as opposed to illustrating, the scale of the Cambodian genocide to the public on hand of photographs. Now for the Rwandan genocide of 1994, which I have already written about before. Death toll estimates range from about 500,000 to over 1 million. The former figure was mentioned by the head of the ICRC delegation in Rwanda, Philippe Gaillard, before he couldn’t "count anymore". Up to 800,000 are estimated in a demographic study;  this is also the most widely stated figure. About 250,000 victims, brought in from various places, have since 2001 been buried in burial grounds by the Kigali Memorial Center, which pertains to the Genocide Archive of Rwanda, the Rwandan equivalent of the Documentation Center of Cambodia. 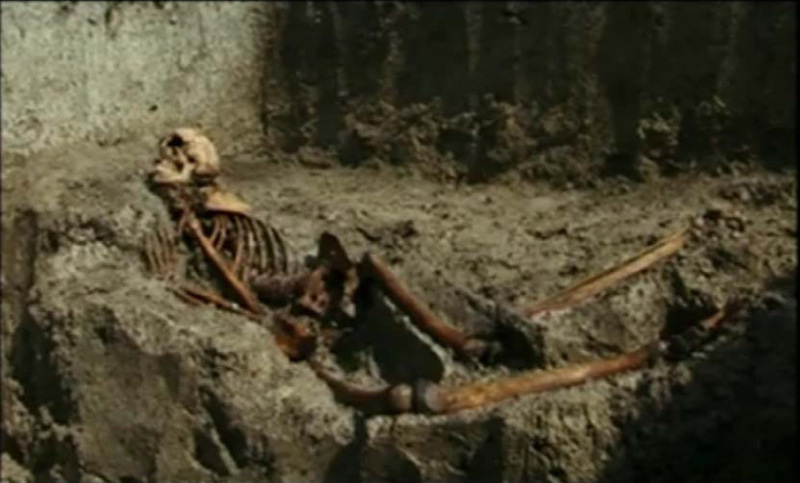 The archive’s collections include several series showing photos of exhumed human remains. 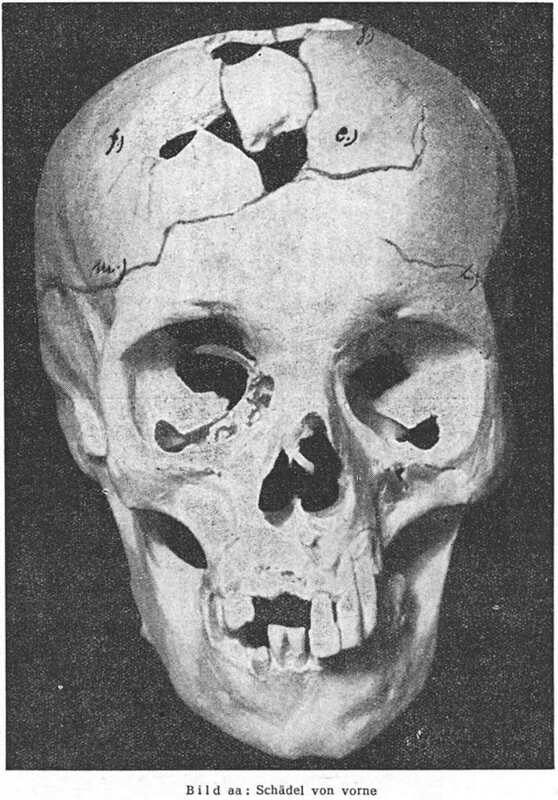 Two of these series, available here and here, contain a total of 77 photographs excluding repetitions, showing human remains corresponding to about 1,170 human corpses in total (assuming that no two photos show the same remains). Another collection seems to be empty, and to another, which may also contain at least some images of human remains, I could for some reason gain no access despite having registered twice under different user names. Many other photographs are available on the internet, mainly in the (careful, very graphic!) gettyimages collection of about 4,500 photos on themes pertaining to the Rwanda genocide and the subsequent refugee crisis. 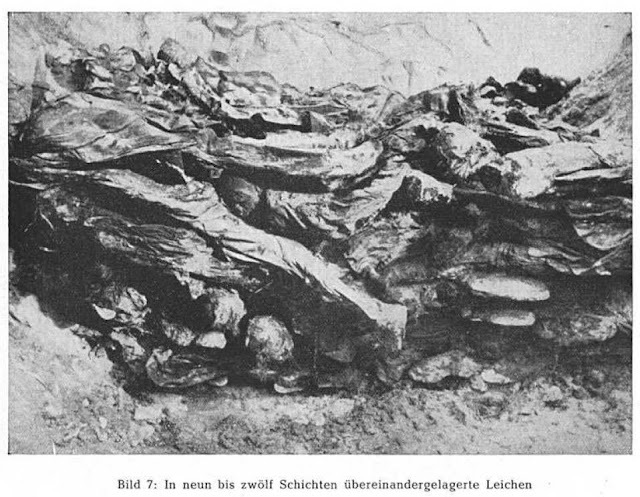 428 of these photos, some repeated, show human remains or possible human remains, including both skulls and bones on racks in memorials and images taken while the genocide was going on. A rough count of the number of dead people (freshly killed, decomposing or as skeletons), yields a generously counted/estimated total of about 7,880 (again, assuming that no two photos show the same corpses, which is hardly a realistic assumption as concerns the memorial skeleton collections copiously photographed by visitors, and besides there are other photos that obviously show the same "whole" corpses). Added to the aforementioned about 1,170 from the Genocide Archive of Rwanda gallery there would thus be about 9,050 corpses "whole" or as skeletons shown on publicly available photographs of the Rwanda genocide and its aftermath. The number would be much lower if corrected for double counts (I counted 58 cases in which all or some of the human remains shown on a photograph are surely or probably also shown on at least one other photograph, and I’m not claiming that my count is complete), the number of corpses that can be made out on publicly available photographs of the Rwanda genocide and its immediate aftermath amounts to just about 1.06 % of the about 850,000 victims of that period. It would take 9,392 such photographs to photographically document the whole body count. As in the Cambodian genocide and the mass killings by Nazi Germany and the Stalinist USSR, only a tiny fraction of those killed can be seen on publicly available photographs. What about judicial procedures, such as have taken place regarding the Cambodian and Rwandan genocides and mass killings during the 1992-95 Bosnian War? Is the number of victims documented more completely there? I put together a YouTube slide show with 289 photos from the Yad Vashem archives, which lasts 24:05 minutes A slide show of 9,392 images (Rwanda) would thus take about 13 hours, and one of 28,751 images (Cambodia) would take about 40 hours. 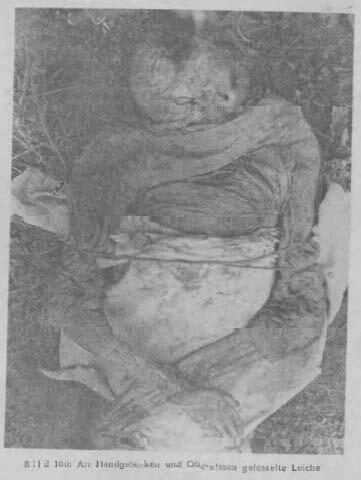 So, were participants at any of the Rwanda or Cambodia trials treated, for hours, to grisly images like the ones reproduced below? As concerns the trials of key figures of the former Cambodian Khmer Rouge regime by the Extraordinary Chambers in the Courts of Cambodia, the published summaries of the judgments against Kaing Guek Eav and against Nuon Chea and Khieu Samphan don’t suggest that this was the case. 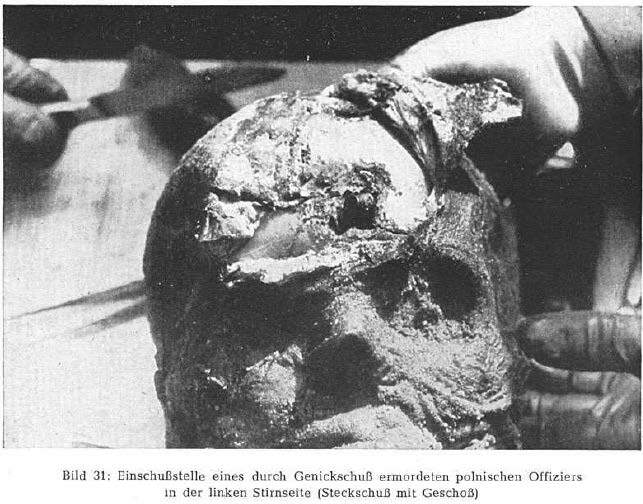 In the case of atrocity investigations, forensic archaeologists present to the courts detailed logs and maps of what is found, with interpretations. Official reports, which include photos, are disclosed to the defense. In accord with Bright’s findings, usually the defense does not want the judges to see the gruesome pictures. So the reports are unchallenged by defense counsel. The defense prefers to argue the line of “you prove that our client was seen pulling the trigger.” That has happened in most cases that I have worked on. Yet the Srebrenica defense teams also devised a strategy to question whether, because of our supposed preconceptions, our archaeological investigation missed identifying military clothing, and whether the number of bodies in the ground was less than we estimated.11 I have vivid memories of a grueling cross-examination in The Hague in February 2007. On and on went the questions about the possibility of my being mistaken in my observations and conclusions. I insisted that I had not seen an item of military clothing on the 2000–3000 bodies my team had exhumed. I insisted that I was not mistaken in seeing high numbers of blindfolds and arms tied behind the back. Words, words, words from both myself and the defense team of barristers. In his right of reply the prosecuting barrister said nothing; he simply put up two photos on the court’s screen. 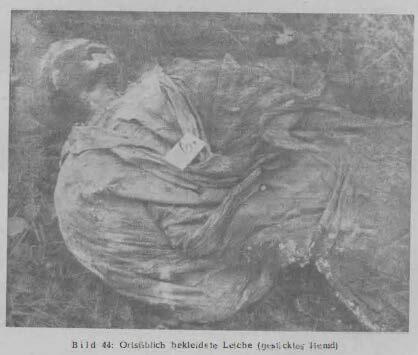 They were the photos from my official report of a man in civilian clothes, who had broken the ligature fixing his hands behind his back, slipped his blindfold down, and grasped a shrub at the moment of death. The prosecuting barrister asked me a single question. Were these photos the sort of evidence that led me to my conclusions. I said yes. The prosecuting barrister said he had no more questions for me. I think that the photos of a body cut through the verbiage of the courtroom, effectively arresting the defense efforts to reinterpret the evidence. Verdicts are awaited as I am writing this. Obviously Richard Wright did not produce photos showing all 2000–3000 bodies his team had exhumed at Srebrenica, nor was he asked to do so. The evidence was his expert witness testimony about the exhumation and examination work he had conducted and the conclusion he had reached as concerns the crime under investigation. 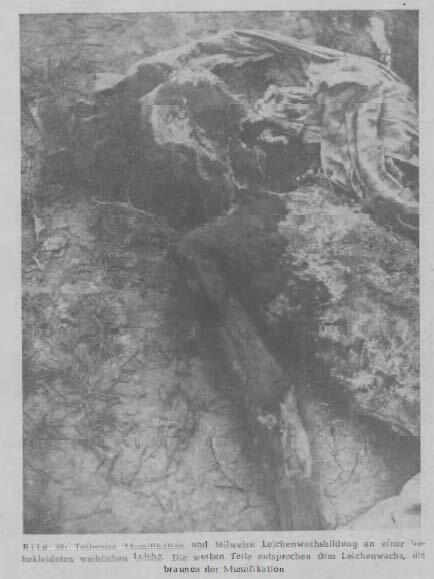 Two photographs, showing a single victim of the massacre, were produced to corroborate Wright’s statements as concerns the quality (not the quantity) of the killings. So we can see that the purpose for which photographs of murdered people are shown at criminal trials regarding mass crimes does not differ much from the purpose for which they are shown to the public: in order to document the nature and quality of the crimes, and not in order to document the numbers of their victims. 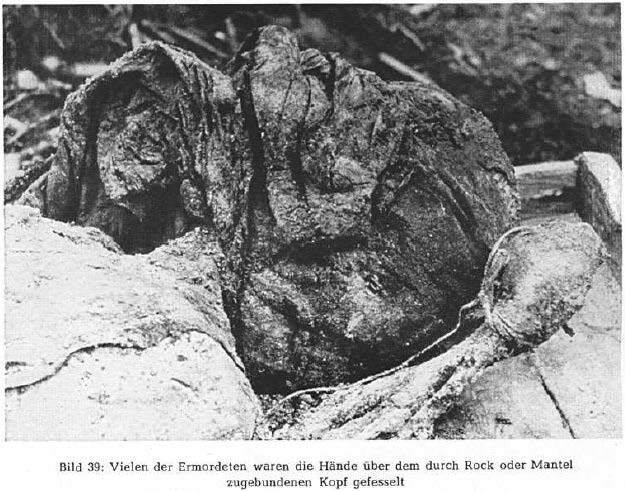 Considering all the above, Mattogno’s expectation to see "hundreds of thousands" of corpses on "hundreds" of exhumation photos reveals that he is ignorant not only of the obvious limitations of the camera eye, but also of what photographs are suited and used for in the context of documenting mass crimes. 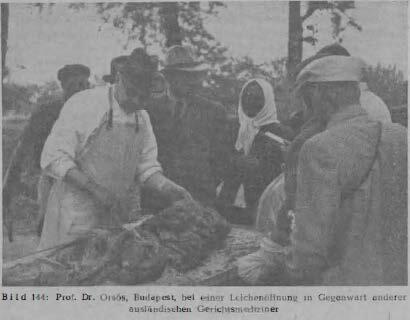 At the end of the chapter here discussed, Mattogno concludes that "the existing photographic material does not confirm the order of magnitude of the killings mentioned in the Einsatzgruppen reports – not even remotely." That may be so, but it is also irrelevant. 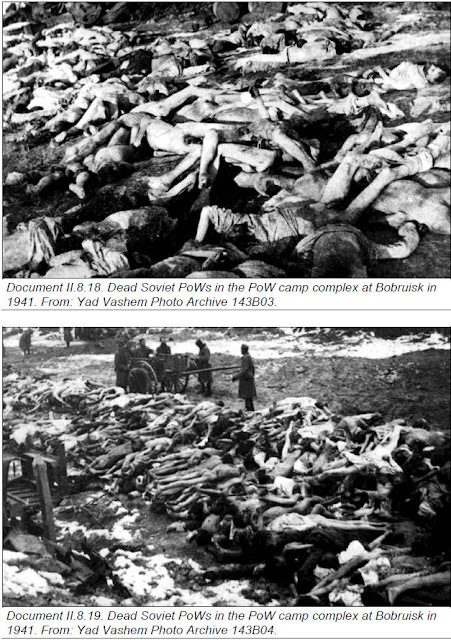 No existing photographic material regarding the Cambodian genocide, the Rwandan genocide or Stalin’s Great Purge and other mass killings by the Soviet NKVD, not to mention the Holodomor and the Gulag, confirms the order of magnitude thereof – not even remotely. No one has claimed that it does, no one with a notion of the evidentiary purpose and value of photographs or film footage would expect it to, and no one with a notion of judicial investigation or historical research would claim that this means anything regarding the factuality of these crimes and the sufficiency of the corresponding evidence. 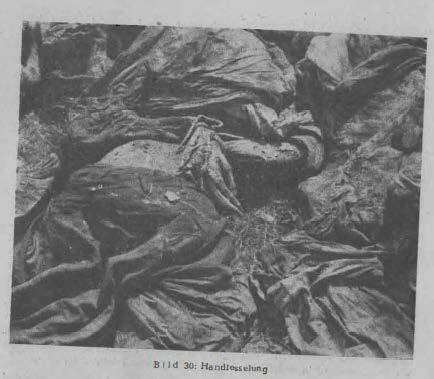 This, in turn, means that all "oh but only so-and-so-many corpses can be seen on photographs" arguments in Mattogno’s Einsatzgruppen book are non-arguments and can be safely ignored. 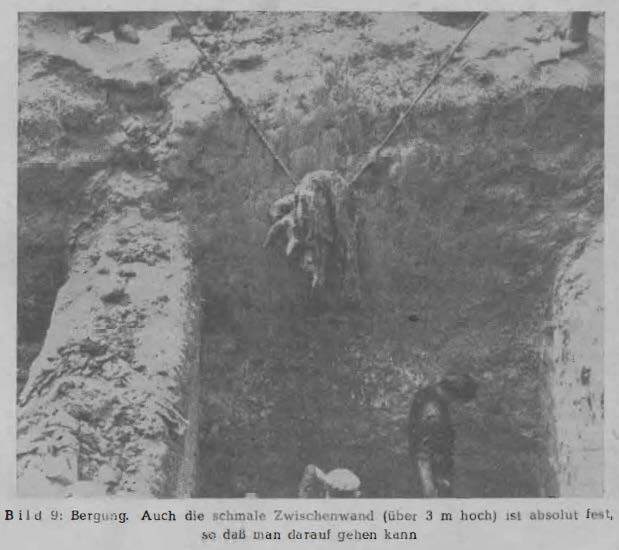 The Einsatzgruppen in the Occupied Eastern Territories: Genesis, Missions and Actions (hereinafter "TEG"). Mattogno’s attempt to "defuse" this highly explicit and incriminating document is addressed in my series "Mattogno takes on the Jäger Report (well he tries)", which commences here. Ghetto Fighters House Archives, check "Photo Archive". 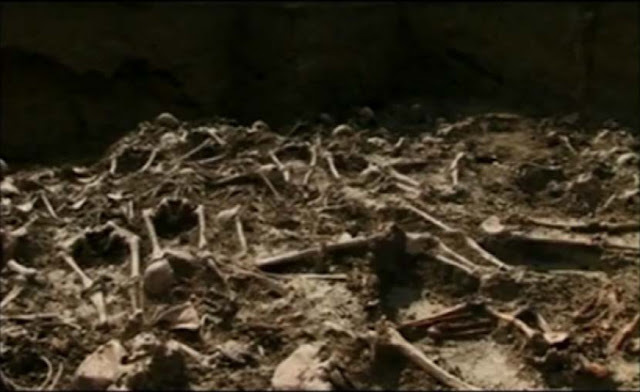 See my articles Mattogno on the Mass Graves at Ponary (Part 1) and Mattogno on the Mass Graves at Ponary (Part 3). Item ID 80349, Archival Signature 115DO1. • Rosenberg’s letter to Keitel dated 28 February 1942. 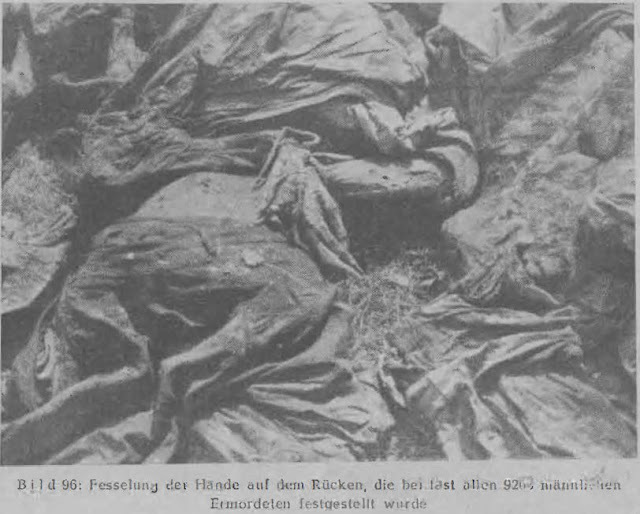 Rosenberg states that, of about 3.6 million Soviet prisoners taken until then, "only several hundred thousand are still able to work fully", and describes the mass mortality among the prisoners in some detail. • The document Nachweis des Verbleibs der sowjetischen Kriegsgefangenen Stand 1.5.1944 (Bundesarchiv/Militärarchiv, RH 2/2623, Bl. 21-23); a transcription can be found here. The document mentions 1,981,364 deaths of POWs (845,128 deaths in the OKW area plus 1,136,236 in the OKH area), plus 963,463 "other losses" (490,441 in the OKW area plus 473,022 in the OKW area). 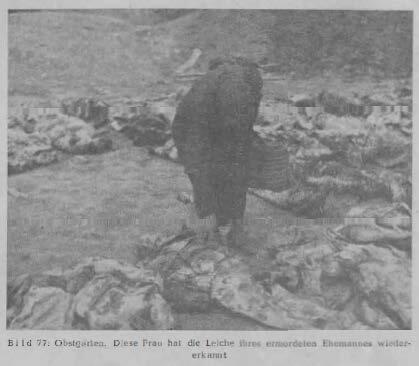 As the "other losses" include prisoners turned over to the SD or the SS, a large proportion of these prisoners must have been killed or otherwise perished. Based on this document German public prosecutor Alfred Streim estimated a number of "at least 2 530 000" Soviet PoWs who died in Soviet captivity. German historian Christian Streit (Keine Kameraden. Die Wehrmacht und die sowjetischen Kriegsgefangenen 1941 – 1945, Verlag J.H.W. Dietz Nachf., Bonn, pp. 10 ff. and footnote on p. 304) insists that his estimate, whereby about 3.3 million out of 5.7 Soviet PoWs died, is supported by a listing of the Abteiling Fremde Heere Ost, which mentions 5,754,528 Soviet PoWs taken until February 1945, an order of magnitude also borne out by the Chief of Prisoner of War Matter, who estimated a total of 5.6 million Soviet PoW until December 1944. Prisoners of war included not only Red Army servicemen taken on strength but also members of special formations of civilian authorities, people’s defense, workers’ battalions, militia etc. as well as are those mobilized who were taken prisoner before they were integrated into the troops (Streit, as above p. 20). • On 19 February 1942 the head of the Working Group Labor in the Four-Year Plan, Ministerial Director Mansfeld, held a lecture before the Reich Economy Chamber about "general questions of labor usage". 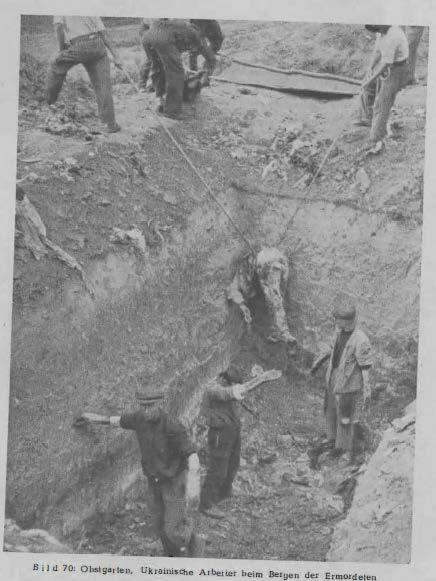 In regard to the steadily worsening lack of workers, Mansfeld declared that out of about 3.9 million Soviet PoWs taken only 1.1 million were left. According to a listing by the Army High Command/ General Quarter Master cleansed of erroneous reports, until 20.12.1941 3,350,639 prisoners had fallen into German hands. 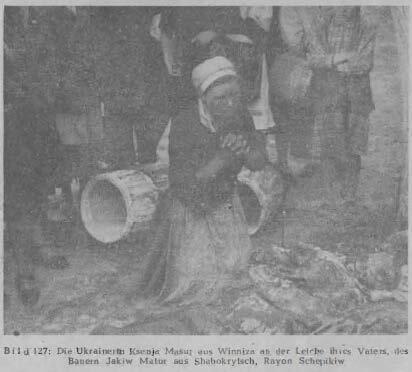 Of these 280,108 had been released and 1,020,531 were still in German captivity on 1.2.1942, which means that over 2 million Soviet PoWs had died until that date already (Streit, as above p. 128). 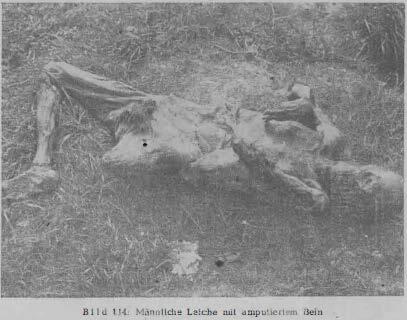 Some of these photographs are shown in my article Photographic documentation of Nazi crimes. TEG pp. 785-786 (Documents II.8.18, II.8.19 and II.8.20). The abbreviation "Dulag" stands for "Durchgangslager", meaning a transit camp through which PoWs were moved to a Stammlager, a camp where they were meant to stay. Streit, Keine Kameraden, pp. 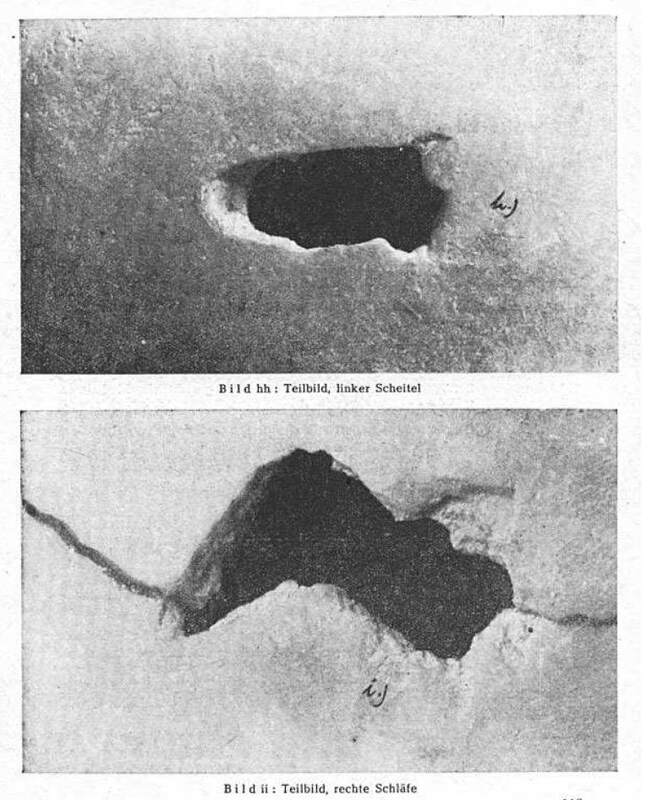 156 f., quoting a detailed by one Colonel Marschall dated 22 November 1941, about the situation at various Dulags. 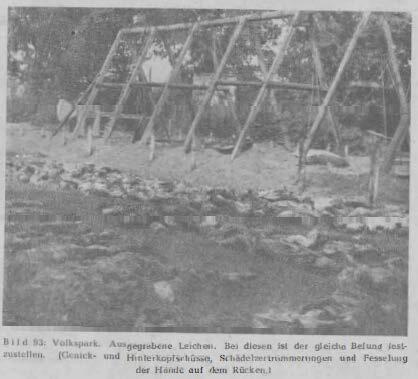 The total number of the camp’s victims throughout the existence of Dulag 131 was estimated by Belorussian authorities at about 40,000 (Christian Gerlach, Kalkulierte Morde: Die deutsche Wirtschafts- und Vernichtungspolitik in Weißrußland 1941 bis 1944, p. 856; translated excerpt here). 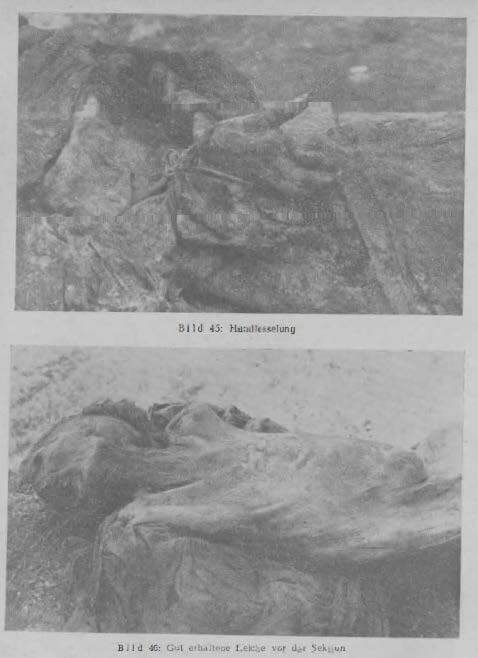 The upper photograph is shown in Karel C. Berkhoff, Harvest of Despair. Life and Death in Ukraine under Nazi Rule, 2004 The Belknap Press of Harvard University Press, Cambridge, Massachusets and London, England. 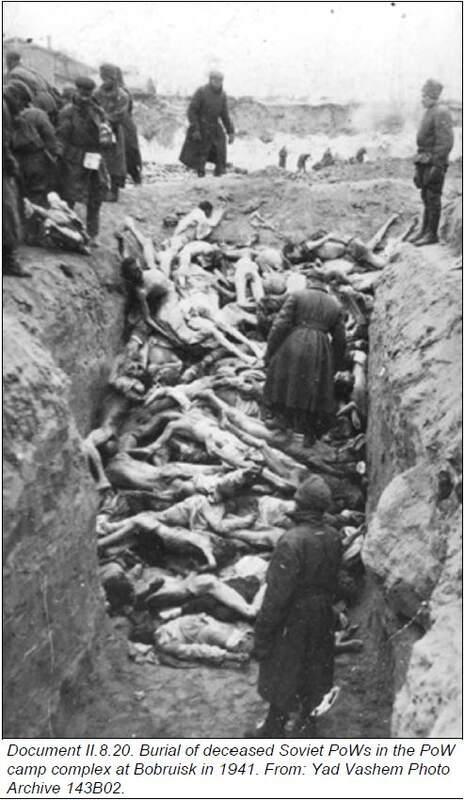 It is captioned "Open mass grave with thousands of Jews. Podolian town of Proskuriv (today Khmelnytsky), 1941 or 1942 (Muzeum Wojska Polskiego, courtesy of United States Holocaust Memorial Museum, Photo Archives, 17781)". According to this Yad Vashem page, at least 3,000 Proskurov Jews were murdered on 4 November 1941. 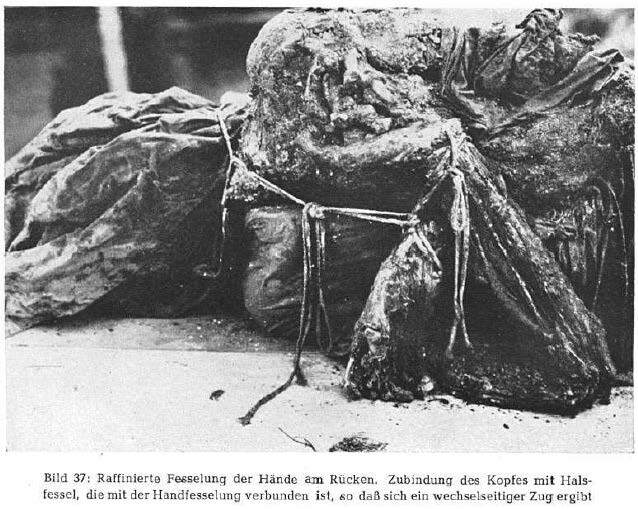 Regarding the context and provenance of the lower three photograph see my article The Kamenets-Podolsky Massacre. 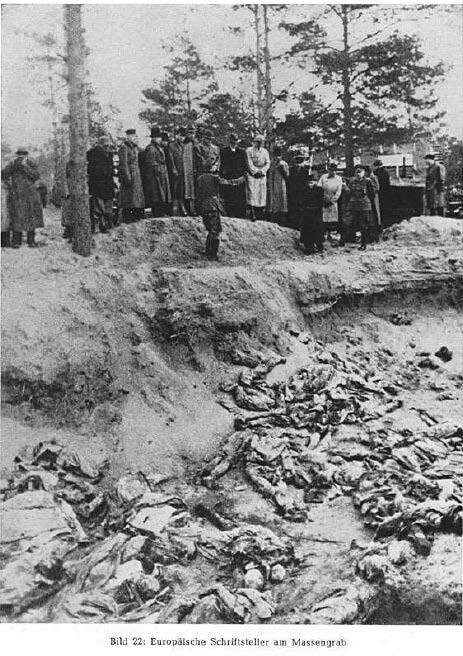 If correctly attributed, they show some of the about 23,600 Jews who, according to documentary evidence, were killed at Kamenets-Podolsky in late August 1941. The photos are shown on TEG pp. 763 and 764 (Documents II.5.1, II.5.2 and II.5.3). TEG p. 549. 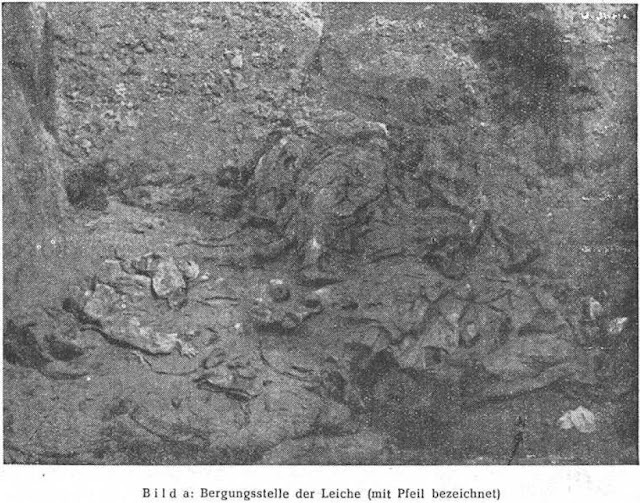 Although each of these photos obviously shows only a (presumably quite small) part of the mass grave by which it was taken, Mattogno argues as if the pictures showed the whole of at least one grave. 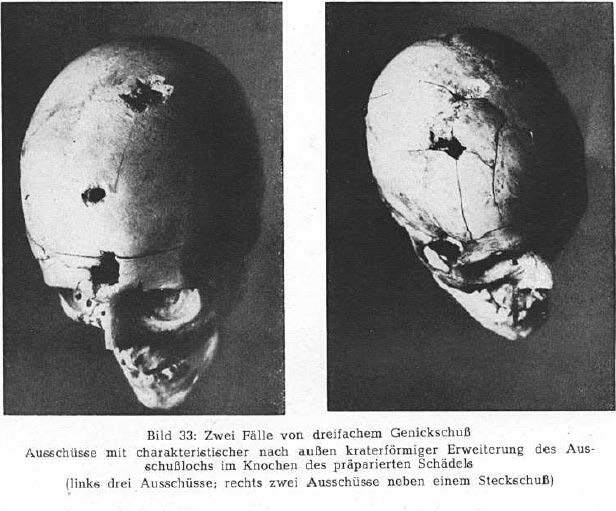 See my article Nazi killing methods, quoting German historian Dieter Pohl. 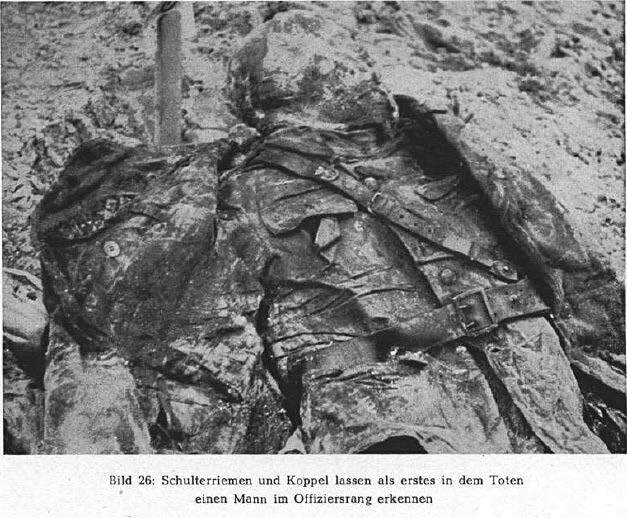 Amtliches Material zum Massenmord von Katyn. Im Auftrage des Auswärtigen Amtes aufgrund urkundlichen Beweismaterials zusammengestellt, bearbeitet und herausgegeben von der Deutschen Informationsstelle. Berlin 1943, Zentralverlag der NSDAP Franz Eher Nachf. GmbH. The report can be read and downloaded under this link. 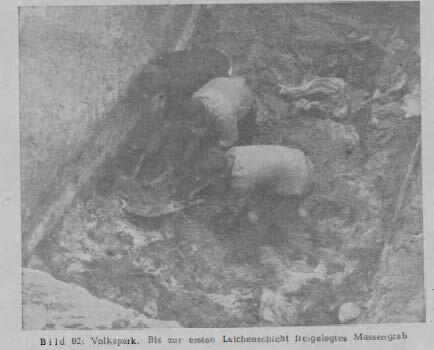 Exhumations of all or most corpses buried at a Nazi mass killing site, which occurred for instance at Žagarė in Lithuania (see my article Mattogno takes on the Jäger Report (well, he tries) - Part 5 (2) and at Smoliarka, Luninets, Lakhva and Koshangrodek in Belorussia (see Nick Terry’s article Mass Graves in the Polesie) were the exception in Soviet investigations. 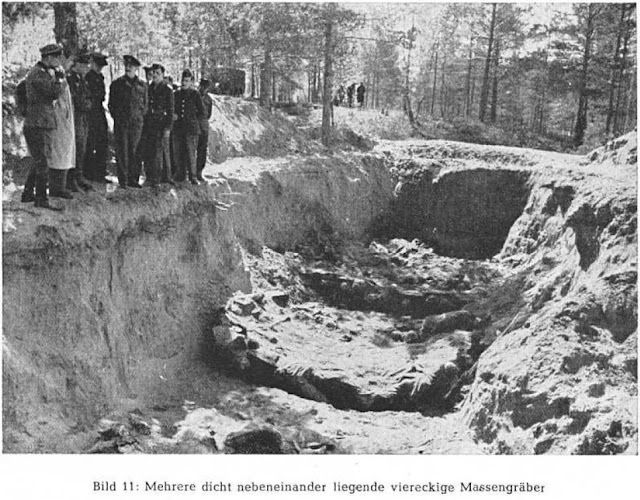 Most of the investigators preferred to open a grave, measure its dimensions, check the identity of the corpses (i.e., whether in military uniform and therefore Soviet prisoners of war, or in civilian clothing), by exhuming some of them, and estimate their number based on a volume calculation. 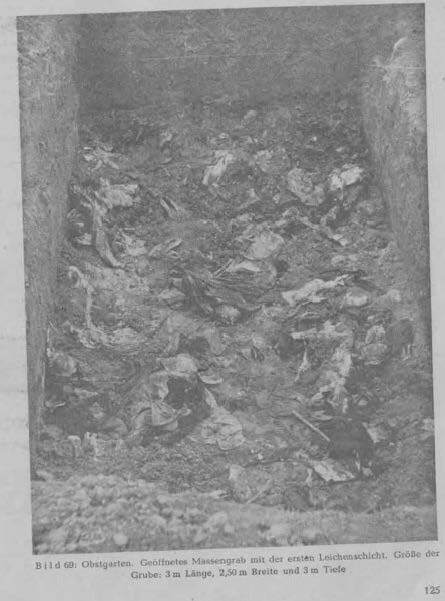 In my aforementioned article I show a drawing (of a mass grave at Gnivan in Ukraine) that illustrates the reason, or one of the reasons, why such estimates could be widely off the mark. In Wald von Katyn. A mentioned in an earlier article, this documentary is noteworthy as one of the sources showing that "liquidation" in the Nazis’ vocabulary meant physical killing. This order of magnitude, based on research in the archives of the former Soviet Union (which has laid to rest widely exaggerated estimates from the Cold War area), is mentioned in American historian Timothy Snyder’s article Hitler vs. Stalin: Who Was Worse?. See also Richard Overy, The Dictators, 2004 Penguin Books, London, pp. 193 ff. (excerpt available here). According to Michael Elman (Soviet Repression Statistics: Some comments, in: EUROPE-ASIA STUDIES, Vol. 54, No. 7, 2002, 1151–1172), the most convincing estimate of the Great Purge’s death toll is in the order of about 950,000 to 1.2 million. This number includes both execution deaths and deaths in detention (some of which were also deliberate). See my article Germar Rudolf’s foreword to Mattogno’s Einzatzgruppen book. 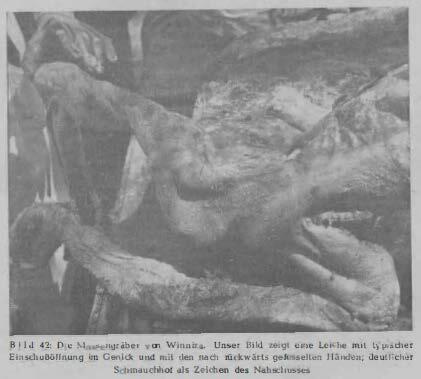 Amtliches Material zum Massenmord von Winniza. 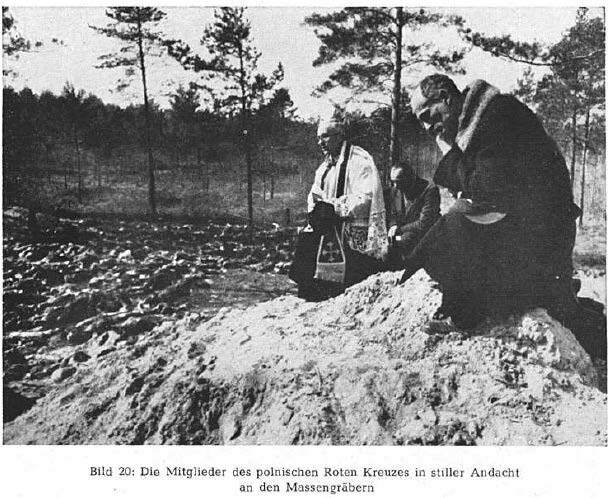 Im Auftrage des Reichsministers für die besetzten Ostgebiete aufgrund urkundlichen Beweismaterials zusammengestellt, bearbeitet und herausgegeben Berlin 1944, Zentralverlage der NSDAP Franz Eher Nachf. GmbH. The report can be downloaded under this link. See the German documentary Lemberg 1941. Namely the well-known, anti-Semitic pamphlet "Latvia: Year of Horror" (available for download under this link). Applying the standards of evidence that "Revisionists" demand when it comes to Nazi mass killings (e.g. Germar Rudolf, quoted here) one might call all of the Stalinist regime’s killing record into question, for not even the Katyn and Vinnitsya forensic investigations, conducted by Nazi Germany, can be considered wholly independent. These are shown especially in Franz Seidler’s books Verbrechen an der Wehrmacht, Kriegsgreuel der Roten Armee: Verbrechen an der Wehrmacht, Band II: 1942/43 and Die Wehrmacht im Partisanenkrieg: Militärische und völkerrechtliche Darlegungen zur Kriegführung im Osten. 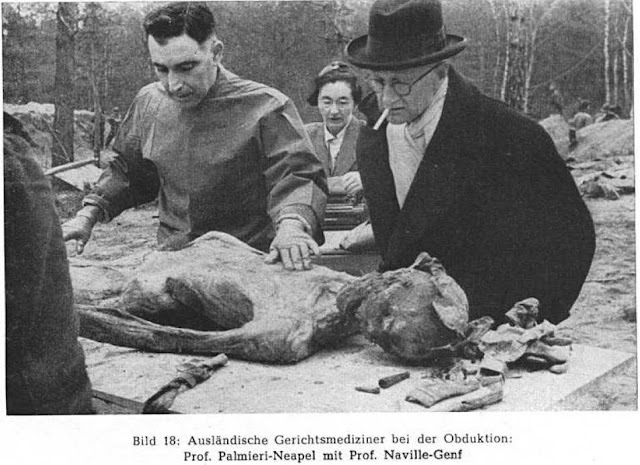 While the images and related reports are certainly authentic, Seidler’s books are otherwise Nazi-apologetic to the point of counting cannibalism among starving Soviet prisoners of war as a Soviet war crime (see my article Scrapbookpages on Subhuman Cannibalism). Seidler also didn’t bother to check the provenance of what turned out to be a forgery of Stalin’s "Torch-men Order" of 27.11.1941 (see my article Blame it on the Germans and Christian Hartmann/Jürgen Zarusky, "Stalins ‘Fackelmänner’ – Befehl vom November 1941. Ein verfälschtes Dokument." 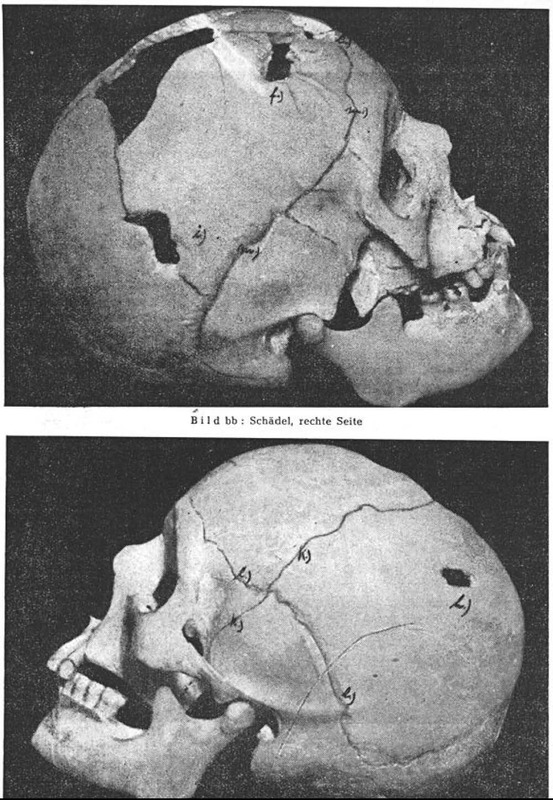 in: Vierteljahreshefte für Zeitgeschichte, Heft 4, October 2000, pp. 667-674). Seidler is also the author of a book with the title Deutsche Opfer: Kriegs- und Nachkriegsverbrechen alliierter Täter 1945. 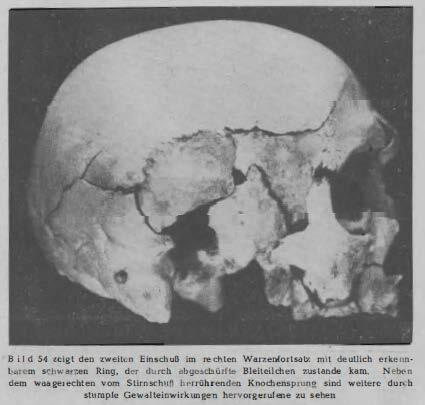 Figures range from 357,687 out of 2,388,443 (14.9 %), as per files of the Soviet NKVD to about 1,094,000 out of 3,155,000 according to a commission of West German scientists in the 1960s. 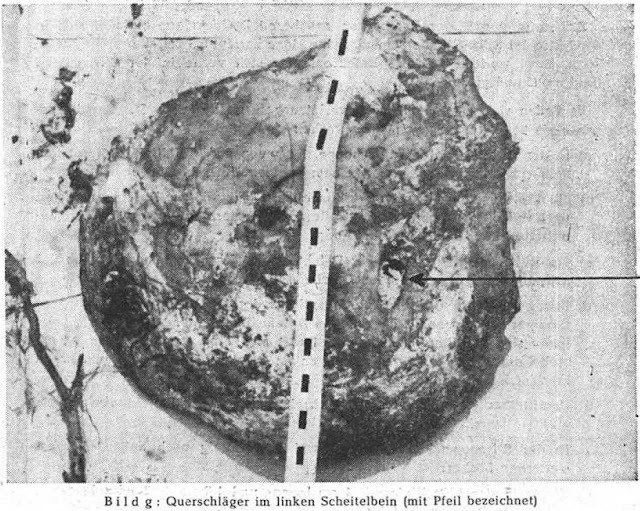 The most probable order of magnitude, according to German historian Christian Streit, is around 700,000. See Streit, "Deutsche und sowjetische Kriegsgefangene", in Wolfram Wette/Gerd R. Ueberschär, Kriegsverbrechen im 20. Jahrhundert, 2001 Wissenschaftliche Buchgesellschaft Darmstadt, pages 178 to 192. A translation of Streit’s article is available here. Most prisoners taken by the Soviets in 1941 seem to have been killed on the spot. Out of 60-70,000 Wehrmacht soldiers captured by the Soviets until the end of 1941 only 9,147 reached the camps in the rear (Christian Hartmann, Wehrmacht im Ostkrieg. 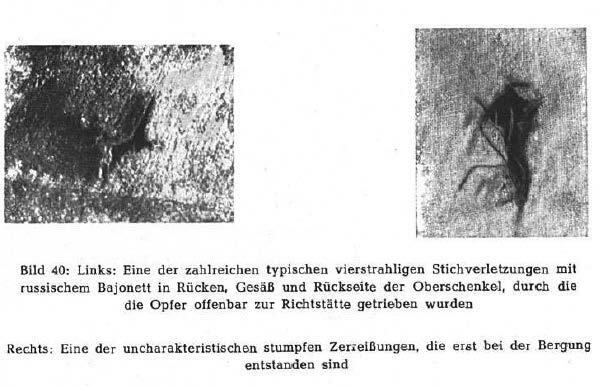 Front und militärisches Hinterland 1941/42, p. 566). 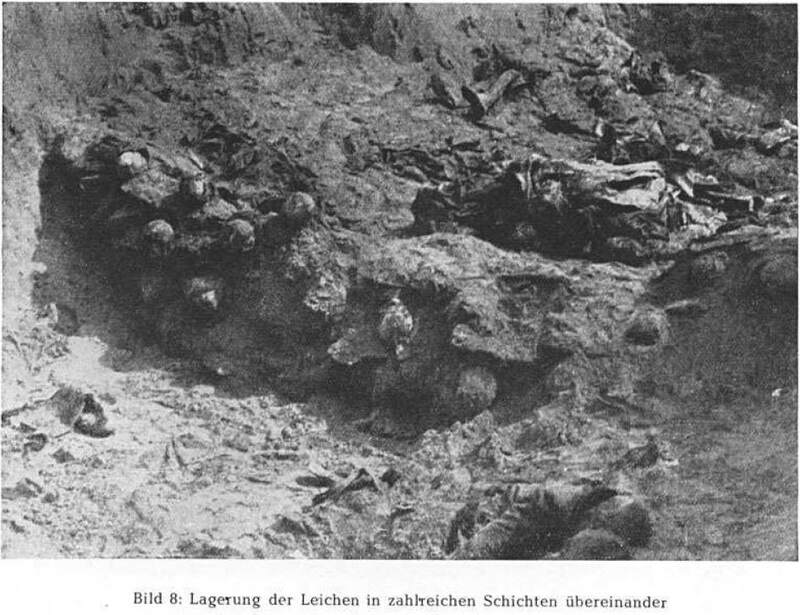 A similar number of Soviet PoWs is likely to have been murdered by German troops right after capture, and the number of Soviet prisoners who perished during evacuation to the rear could well amount to a six-digit figure (Hartmann). Most of these images, e.g. the ones reproduced here, are attributed to the Nemmerdorf massacre on 21 October 1944. While there is no doubt that Soviet troops murdered many civilians in Germany’s former eastern territories, it has not yet been clarified what exactly happened at Nemmersdorf and to what extent evidence was manipulated by NS authorities for propaganda purposes. Manfred Zeidler, "Die Tötungs- und Vergewaltigungsverbrechen der Roten Armee auf deutschem Boden 1944/45", in: Wette/Ueberschär, as above, pp. 418 to 432. A translation is available here. Quote and figures are from Snyder, as above. 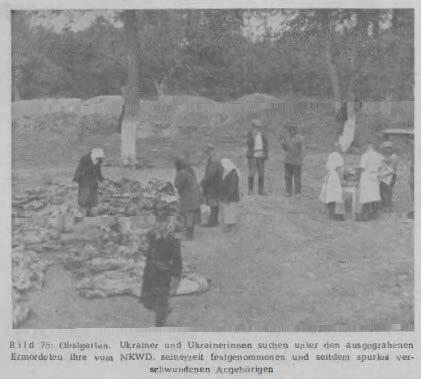 Ukraine's Holodomor Through An Austrian's Eyes. 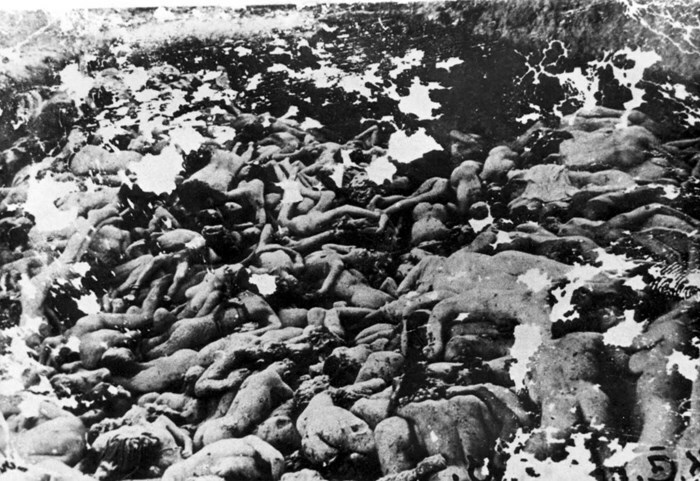 This photo, which is sometimes allocated to the Holodomor, actually shows victims of the Russian famine of 1921–22. Which is still more than the number of victims of the Great Chinese Famine of 1959-1961 photographed after death. Unless I missed something, there is not a single published photo showing some of the at least 15 million victims of that famine. 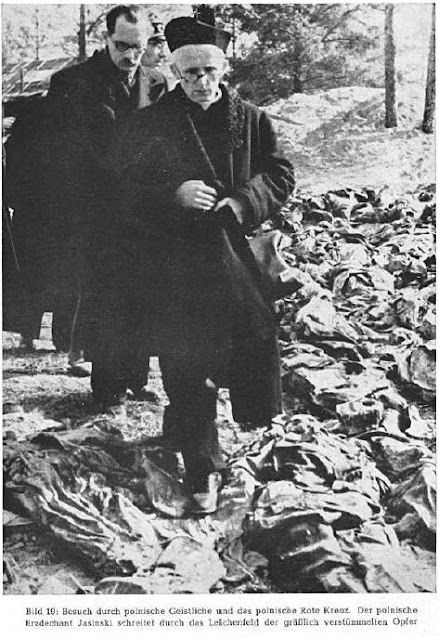 A search for corpses in Yad Vashem’s online photo archive, for instance, yields 4,787 photographs, mostly showing victims of camps and other mass violence by Nazi Germany. The figure is from Snyder, as above. 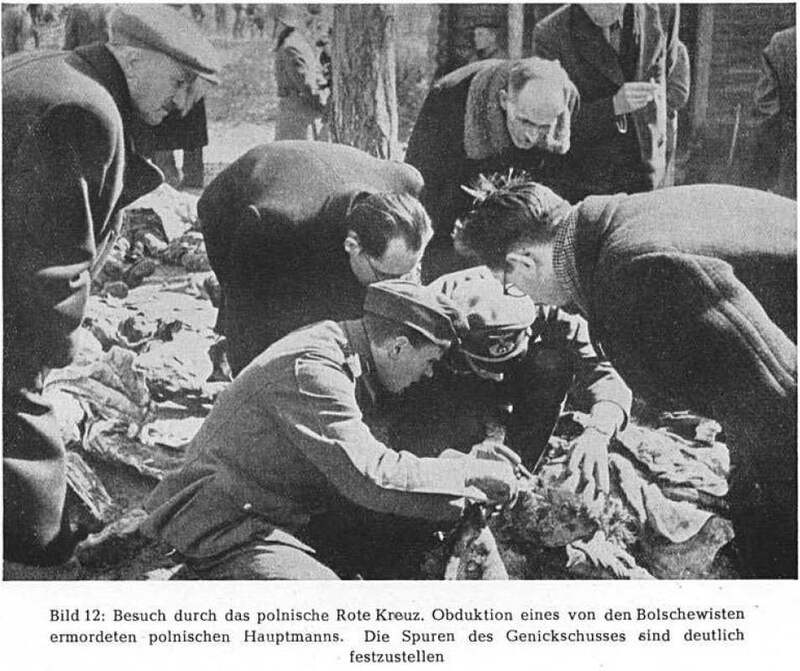 See my article Nazi killing methods. 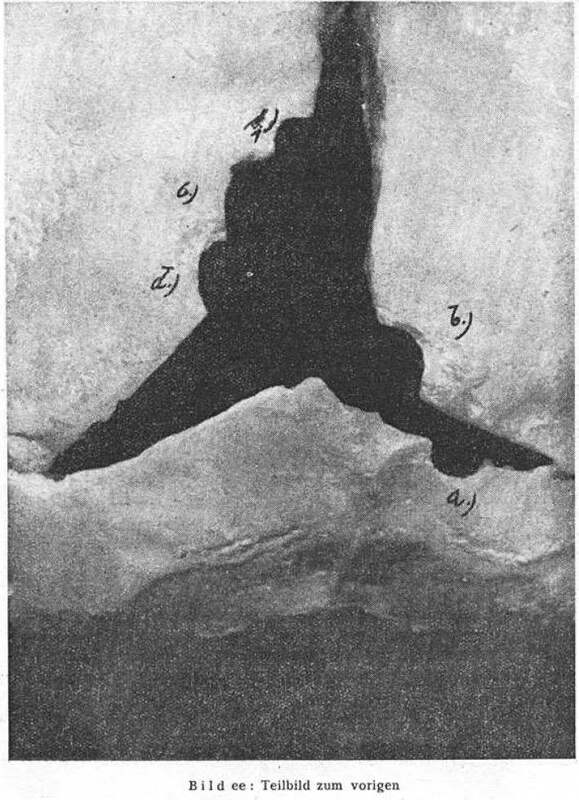 Sharp, as above, based on a personal communication from Etcheson. DC-Cam, Mapping of Cambodia’s Killing Fields (1975-1979). 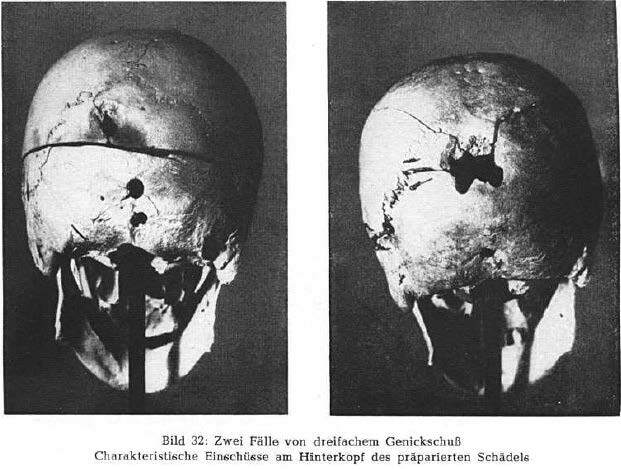 The number is so high because I included in the count a panoramic photo (the only of its kind that I have seen) of lined-up skulls featured on this page (about 1,500 skulls by my estimate) and the S 21 skull map of about 500 skulls, which has been removed because it was considered tasteless or offensive to piety. A nightmare with no way out. PBS Frontline documentary Rwandan Genocide - The slaughter of 800,000 people The statement is quoted at 1:25:47. Marijke Verpoorten, The Death Toll of the Rwandan Genocide: A Detailed Analysis for Gikongoro Province. A more recent assessment by Marijke Verpoorten, in response to much lower figures submitted by two academics, concludes that "512,000-662,000 is a much more plausible range for the Tutsi death toll than a range that includes 200,000". According to the article The Great Lakes Refugee Crisis, about 50,000 people died in the refugee camps in 1994, mostly from cholera and diarrhea. Assuming about 800,000 genocide victims, the death toll of the 1994 Rwandan genocide and its immediate aftermath would thus be in the order of 850,000. Unlike the Cambodian genocide, the remains of which only started being photographed after it was over, the Rwandan genocide was photographed and filmed in progress by reporters, and the images they captured were immediately available to the international media. These stills are from footage of the excavation conducted by Father Patrick Desbois in 2006 at the Ukrainian city of Busk, which is narrated in Desbois’ book The Holocaust by Bullets (excerpts here). The footage can be viewed on YouTube in the documentary La Shoah par balles en UKRAINE (19:50-21:06). Case 001: "During the 72 days of hearing of evidence, 9 expert witnesses, 17 fact witnesses, 7 character witnesses and 22 Civil Parties were heard before the Trial Chamber. Over the course of the trial, the Chamber examines seven thematic areas of relevance to the proceedings: issues relating to M-13; establishment of S-21 and the Takmao prison; implementation of CPK policy at S-21; armed conflict; functioning of S-21, including Choeung Ek; establishment and functioning of S-24; and issues relating to the character of the Accused. Approximately 1,000 documents were put before the Chamber and subjected to examination." Summary of Judgement Case 002/02, p. 3: "Over the course of 24 months of evidentiary hearings, the Chamber heard the testimony of 185 individuals, including 114 fact witnesses, 63 Civil Parties and 8 experts. Close to 5,000 evidentiary documents were subjected to examination and admitted, totalling over 82,000 pages over the three official languages in Case 002/02 alone. In light of Cases 002/01 and 002/02 sharing a Case File, this brought the grand total of evidentiary documents to more than 10,000, totalling over 304,000 pages." The large majority of the documents were obviously written documents, leaving comparatively little room for photographic documentation. Indictments and Judgments. Regarding Pauline Nyiramasuhuko see also Peter Landesman, A Woman’s Work, The New York Times Magazine, 15 September 2002. During the 408 days of the trial of Bagosora et al, 242 witnesses were heard, 82 for the Prosecution and 160 for the Defense. Nearly 1,600 exhibits were tendered (Judgment of 18 December 2008, note 1 on page 1, paragraph 78 on page 15). The crimes that the defendants were charged with were reconstructed mainly on the basis of testimonies from eyewitnesses and expert witnesses. 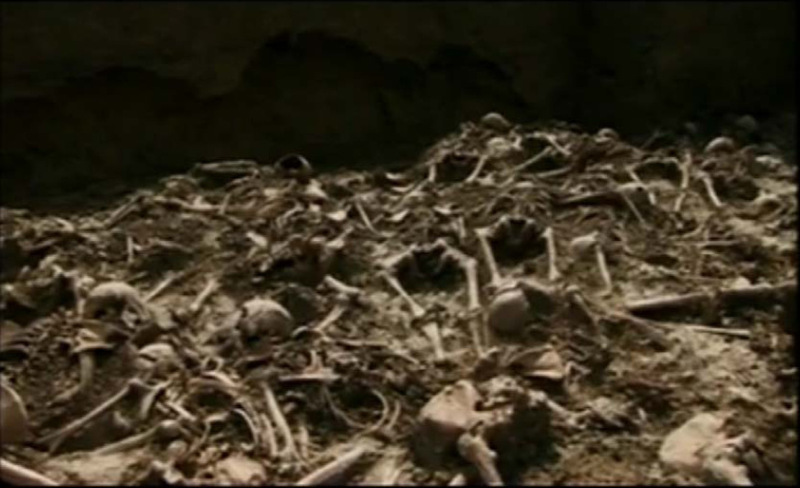 Video footage and stills showing corpses, a photograph of the local memorial, and the testimony of a witness who "identified the footage and recognised some of the victims" are mentioned as evidence that more than 1,000 mostly Tutsi refugees were killed at Nyanza hill on 11 April 1994 (paragraph 1340 and note 1480 on p. 338). Unless I missed something, this is the only reference in the judgment to visual material showing human remains. At the trial of Nyiramasuhuko et al, photographs and video footage, taken long after the events at the crime sites, were used to check the reliability of eyewitness recollections of those sites (landscape, vegetation, buildings, etc.) One a single occasion, in the judgment of 24 June 2011, visual evidence is mentioned in connection with mass graves: "Exhibit 34B showed a view of an alleged mass grave located in Kabakobwa; the mass grave was the flat, green grass surrounded by trees. 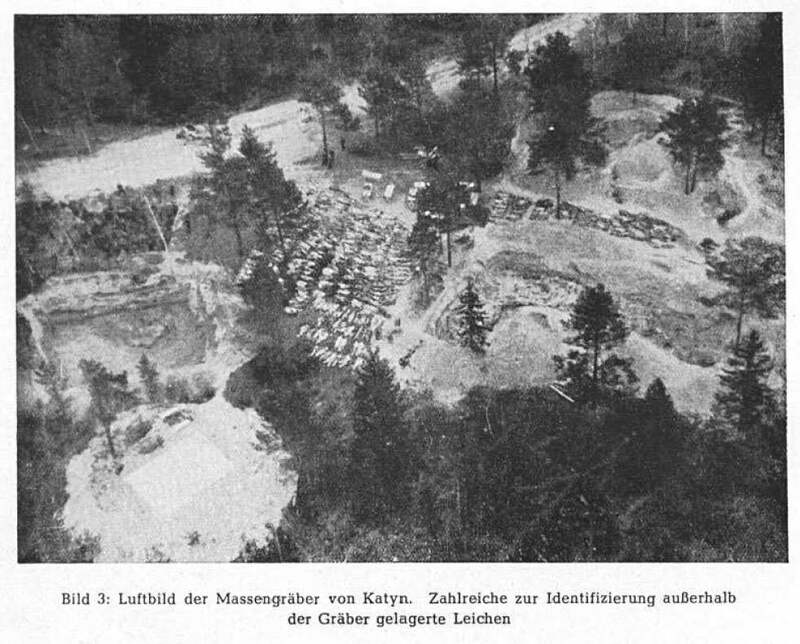 Exhibits 34C, 34D and 34E were views of the alleged mass grave from different angles, and Exhibit 34F represented a view of the road from the valley towards where the mass grave was located on the left side of the photo. 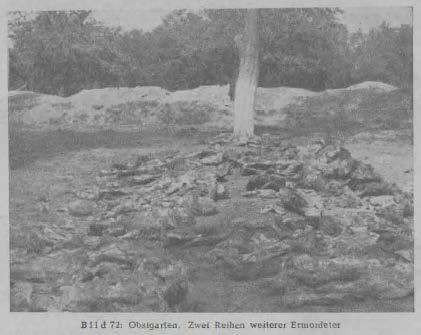 Exhibit 34G was a view of the alleged mass grave from a cluster of the trees surrounding it.4308 Exhibit 35 was the related video footage of the photos regarding Kabakobwa.4309." In the case Gacumbitsi Sylvestre (ICTR-01-64), the following is mentioned in the Trial Chamber’s judgment of 17 June 2004 (paragraph 144 on p. 38, (emphases added): "Prosecution Witness Patrick Fergal Keane, a journalist, who, in May 1994, produced a documentary for the British Broadcasting Corporation (BBC)152 on Rwanda, focussing on the events in Rusumo commune, testified that at the end of May 1994, with the assistance of RPF which was in control of that area, he was in Rusumo and filmed the Nyarubuye Parish building, which was littered with corpses.153 Having heard the stories of the survivors of the events at the parish, he started looking for Bourgmestre Sylvestre Gacumbitsi, and had a conversation with him at the Benaco refugee camp in Tanzania.154 In the documentary, some clips of which were shown and tendered as exhibits,155 many decomposing and intermingled corpses are visible. 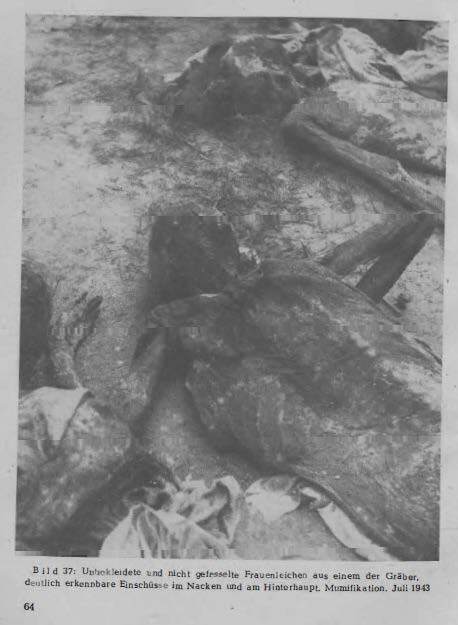 The corpses are numerous, piled on top of each other, in front of a building located behind Nyarubuye Church, under the arches. 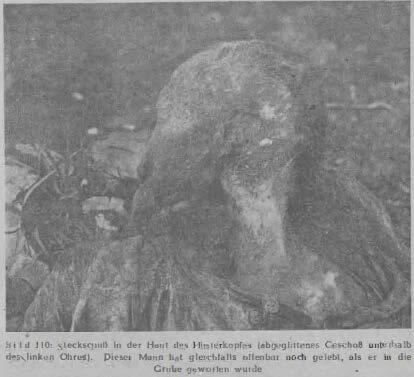 The corpses are those of persons of both sexes, and bodies of children, including some in school uniforms, can be seen." Quantitative information is noted but not established (i.e. 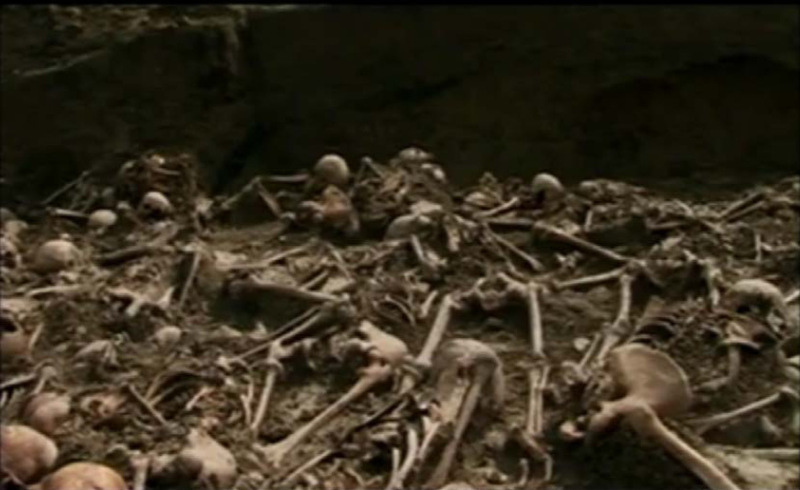 the court didn’t undertake to count the "numerous" corpses), and the qualitative element (i.e. 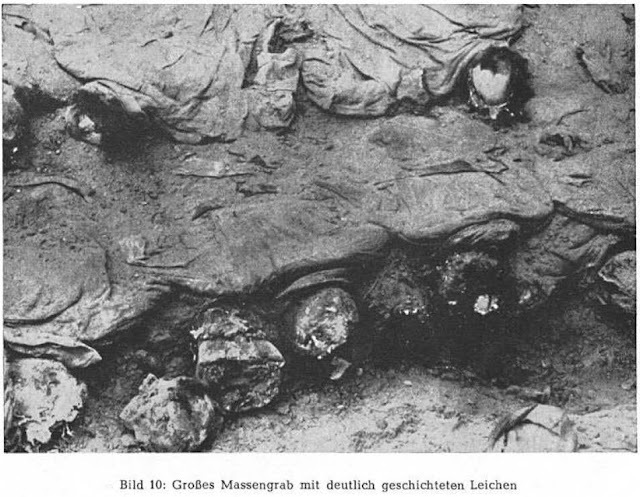 that the corpses were of persons of both sexes including children) was obviously more important. In the Appeals Chamber’s judgment, one finds the following statement (paragraph 95 on p. 36, emphasis added: "With respect to both Fergal Keane and Alison Des Forges,the Appellant argues that their estimates of the number of people killed at Nyarubuye Parish were inflated because the RPF had brought more corpses to Nyarubuye Parish before the documentary was filmed.236 But even if this were true (which the Appeals Chamber need not decide), this would not cast doubt on the occurrence of the attacks to which both Prosecution and Defence witnesses testified. Nor does the Appellant demonstrate that the difference in the estimates would have affected the Judgement in any other way." In other words, the Appeals Chambe deemed the number of corpses to have been irrelevant to the Trial Chamber’s decision. In the case Karera, François (ICTR-01-74), the Trial Chamber judgment of 7.12.2007 contains references (e.g. paragraph 292, note 354 on p. 75) to a forensic report regarding the massacre at Ntarama Church, not challenged by the defense, whereby the corpses of 385 victims were found at the crime site. The forensic report, illustrated with photographs and containing the forensic scientists’ find on how the victims examined had been killed, acknowledges that the number of bodies examined is "appreciably lower than the number of people killed" (Appeals Chamber Judgment of 2 February 2009, paragraph 243, p. 70). In the case Kayishena et al. (ICTR-95-1), reference is made in the Trial Chamber Judgment of 21.5.1999 to a forensic examination by two expert witnesses in which 493 victims were examined (paragraphs 325, 326 on p. 126). The judgment of 3 December 2003 in the trial Nahimana et al. (Media case) (ICTR-99-52) refers to the testimony of a witness who "filmed dead bodies in the river at Kanyaru, counting the bodies as they flowed by and estimated on that basis that there were 3,000 to 5,000 dead bodies per day coming down the river." However, there is no mention that footage of bodies floating by was shown to the court. Richard Wright, "Where are the Bodies? In the Ground", The Public Historian, Vol. 32 No. 1, Winter 2010. 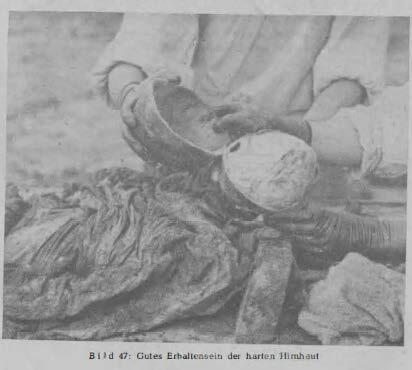 Like in the Katyn and Vinnitsyia investigations by Nazi Germany, an emphasis on quality (aspect of individual bodies, injuries, ligatures and blindfolds, clothing, etc. ), rather than on quantity, also becomes apparent from the images in forensic investigation reports by Wright and others that can be accessed and downloaded on the site SREBRENICA Genocide in eight acts (The Exhumations > Selection of Exhibits). 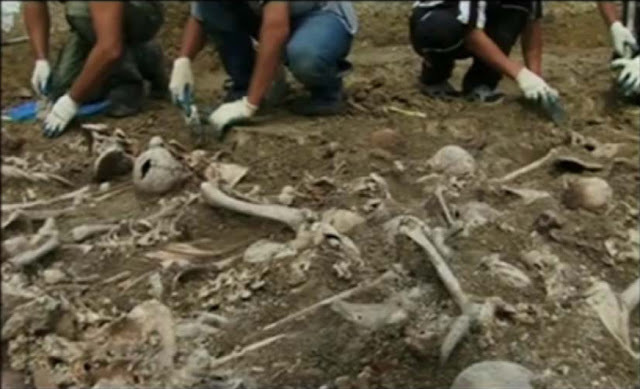 According to this site the Srebrenica investigation, which started in July 1995 and continued through 2014, is arguably the most comprehensive investigation of its kind in the 20th century. 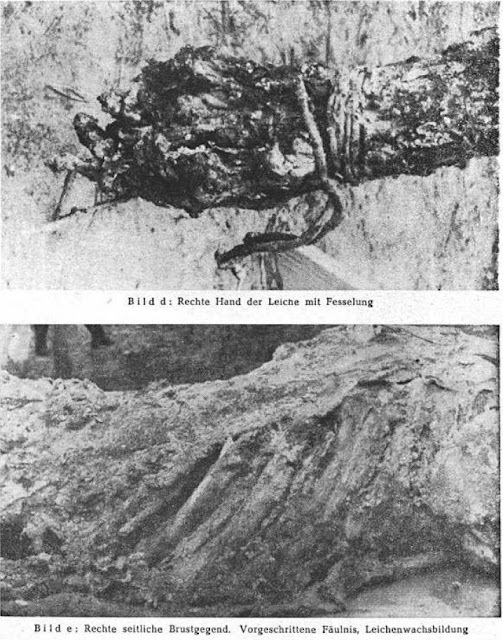 "... Soviet investigation reports should not be accepted at face value but checked whenever possible against evidence uninfluenced by the Soviets, such as German documents and testimonies before criminal justice authorities of the German Federal Republic"
"The Majdanek trial was an extraordinarily complex proceeding; unfortunately, space constraints preclude me from offering a detailed examination of the trial. It is important to note, however, that the source materials obtained from the trial are also problematic, not least because verbatim transcripts of witness testimony had been abolished for Regional Courts and Higher Regional Courts (Landgerichte and Oberlandesgerichte) by a reform of criminal procedure passed on December 9, 1974. 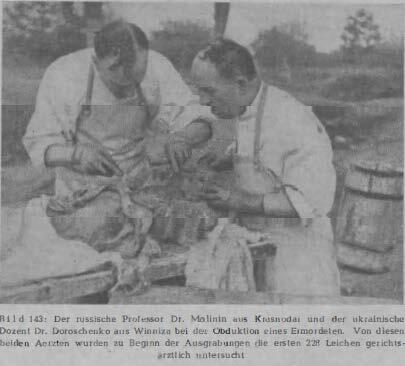 Initially, the Majdanek courtroom proceedings were recorded, but this practice was abandoned after some of the defense lawyers objected. While the investigation launched by the Cologne public prosecutor in 1960 is amply documented, there are no official, verbatim transcripts for the main hearings, held over a period of nearly six years. Instead, we must rely on the written notes kept by public prosecutors, investigative judges, and police authorities. 88. Transcriptions of the content of witness statements were abolished in cases before regional courts and superior state courts by the First Act to Reform Criminal Proceedings Law (1. StVRG § 273 Abs. 2 StPO) of 9 December 1974 (BGBl. 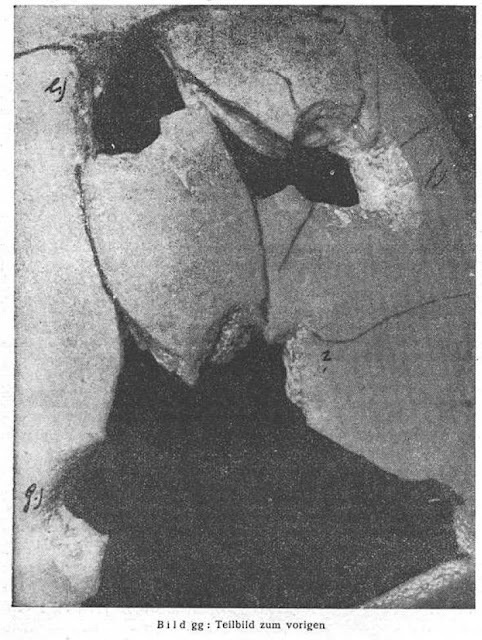 I, S. 3393). I thank Dr. Holger Schlüter for this information." - pp. 13-14 & 290. I count 131 BRD trials, 11 DDR trials and 10 Austrian trials relevant to the Holocaust in the Soviet Union, and most of the BRD trials for the USSR took place before the 1974 change in trial procedure, so there are actually more trial transcripts for these than might be thought; the DDR and Austrian trials generally have trial transcripts. There are relatively similar numbers for Poland, bearing in mind that 38 of the 152 trials in German-speaking countries concerned Distrikt Galizien. But only a fraction of the investigative cases opened in the BRD ever went to trial, so the statements and interrogations gathered in pretrial investigations are always going to provide better coverage and be more widely available for more localities than a statement in a trial transcript. So the 1974 change in trial procedure is not exactly crucial. Reconstructing the Holocaust in the Soviet Union relies in any case on multiple source types of multiple national provenances (in terms of who collected and preserved the sources). The ballpark number can be extrapolated from demographic calculations as has been done several times. German and Romanian official documents confirm well over 1.5 million, probably around 1.7-1.8 million out of the 2.4-2.6 million indicated by demographic calculations (excluding deaths of Soviet Jews in the Red Army, etc, which are factored out). Big chunks of this documented total are region-wide or unit-wide statistics, e.g. the figures in Meldung 51, with other documents giving a partial breakdown. Unofficial German contemporary sources like diaries and letters, plus contemporary non-German sources including Polish underground reports, Lithuanian and Latvian nationalist reports, Swiss and other diplomatic/intelligence reports, Jewish contemporary reports, diaries, manuscripts and letters, are also numerous, especially for the annexed territories of the Baltic states, eastern Poland and Bessarabia/Bukovina, which account for 1.4-1.6 million. There are a fair number of such sources for the pre-1939 USSR (0.9-1 million), but the coverage is less extensive. Postwar investigations from 1945 onwards outside the USSR or East Bloc corroborate pretty much all the really big actions and major localities, but they don't necessarily drill down into every last rayon of a particular oblast - for a certain proportion of localities, the only real sources we have are Soviet Extraordinary Commission reports and interrogations, with some corroborated also by Soviet war crimes trials, especially of collaborators, so these are inconsistently available - Ukraine and Lithuania has been open with these trials, the Russian Federation hasn't been so open. The issue for historians is not whether one source base requires corroboration from another, but rather simply using all the relevant sources we have available. In most cases one can corroborate, in other cases one cannot, and to say anything about the obscure backwater village or town in Belarus or wherever, there's no choice but to use a Soviet source. Since there is such a heavy overlap of corroboration, we can rely on the Soviet sources after we cross-reference with the overall demographic calculations. This doesn't preclude individual localities from potentially being wrong or exaggerated for some reason, but the issue is aggregating the most probable numbers by republic (Estonia, Latvia, Lithuania, Belarus, Ukraine, RSFSR) and oblast. Since getting absolutely precise and 100% corroborated statistics for most instances of region-wide or country-wide mass violence and genocide in modern history is extremely hard, and since we also have extreme difficulties coming up with absolutely certain numbers for individual massacres (e.g. Setif, Nanjing, Murambi in Rwanda) with sources giving conflicting estimates, then one should accept that death toll numbers for outbreaks of truly mass violence, as well as death tolls of civilians in major wars, are not going to be reconstructed on an even basis. 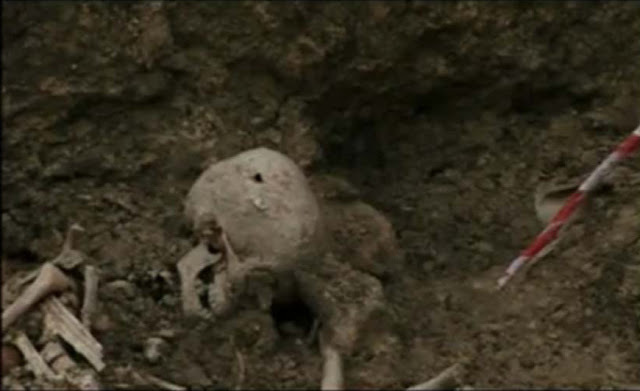 What is also certain is that only a fraction of the deaths in mass violence and genocide were ever investigated via exhumations or forensics, and only a fraction of the deaths, as Roberto has shown in the blog post, were ever documented visually with photographs. "But only a fraction of the investigative cases opened in the BRD ever went to trial, so the statements and interrogations gathered in pretrial investigations are always going to provide better coverage and be more widely available for more localities than a statement in a trial transcript. So the 1974 change in trial procedure is not exactly crucial." "better coverage"! That's clearly not true. In People in Auschwitz, Langbein wrote that former inmate Rudolf Kauer "provided highly incriminating and concrete evidence" at "the preliminary hearing", "but at the trial retracted his testimony". We know from the transcript [newspaper report in English ], that's an enormous understatement. 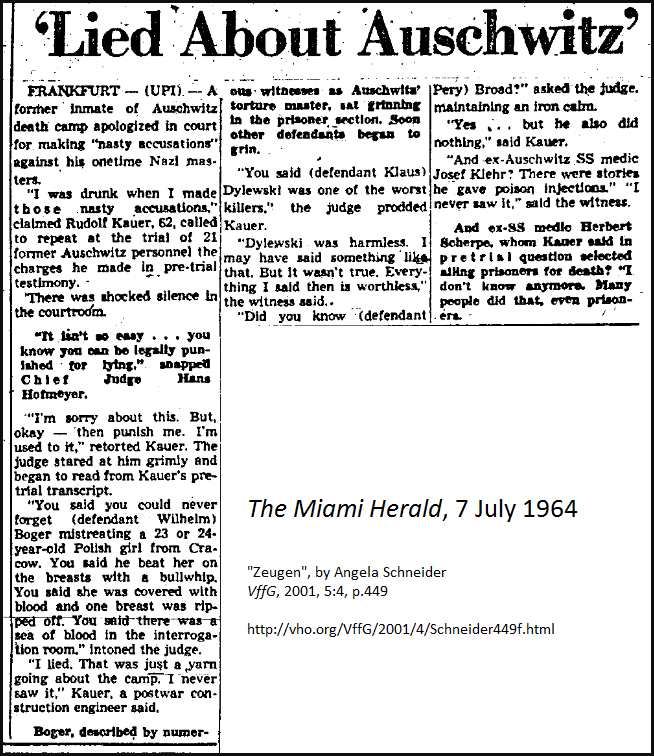 During his 06.07.64 trial testimony, Kauer repeatedly stated that he had lied during his police interrogation 04.01.61 and judicial interrogation 10.10.62, and that those statements were "worthless". It was ruled at the NMT IG Farben trial that witness statements could not be submitted as evidence unless the witness testified in person [exceptions were made for statements from Hoess, as he was dead but had testified at the IMT and his own trial]. > "better coverage"! That's clearly not true. Funny how you make the claim but don't bother to substantiate it (neither the fact that questions are mostly not written down, nor the Kauer incident, nor whatever the rules were for admitting things to a court have anything to do with historiography). BRoI, you're confusing depth for breadth. Roberto's blog post is about the Holocaust in the Soviet Union, which means dealing with republics and regions, not concentration camps; it means dealing with not just the major cities (Minsk, Wilno, Riga, Kiev, Odessa etc), but also provincial counties and small towns. GK Weissruthenien, for example, had 95 ghettos, as identified in the USHMM Encyclopedia vol. II. But there were only 13 trials relating to units and offices stationed in GK Weissruthenien. Even though some of the trials concerned central units like KdS Weissruthenien and discussed actions in provincial towns, it's clear that not every ghetto liquidation in GK Weissruthenien was discussed in a West German court. The ZStL did survey the entire region as best as it could, but did not advance to indictments for every last locality. Thus one finds that Gebietskommissariat Glebokie was investigated as AR-Z 37/60 from 1959 to 1972, leaving five case files of 1,950 pages and two other files, but this generated no trial. A trial *was* completed regarding the final liquidation of the Glebokie ghetto, in 1976 (so no trial transcript), affecting members of Pol.Rgt. 26, but the main sweep in this region was actually carried out by Trupp Lepel of Einsatzkommando 9 in the summer of 1942, and this was never prosecuted. We have several documents for the summer '42 action in GebK Glebokie - a report from the GebK giving a breakdown, an application for a Bandenkampfabzeichen for an EK 9 member that mentions the sweep, and Kube's report to Lohse (3428-PS) which discusses the cross-border foray by the Army Group Rear Area (i.e. 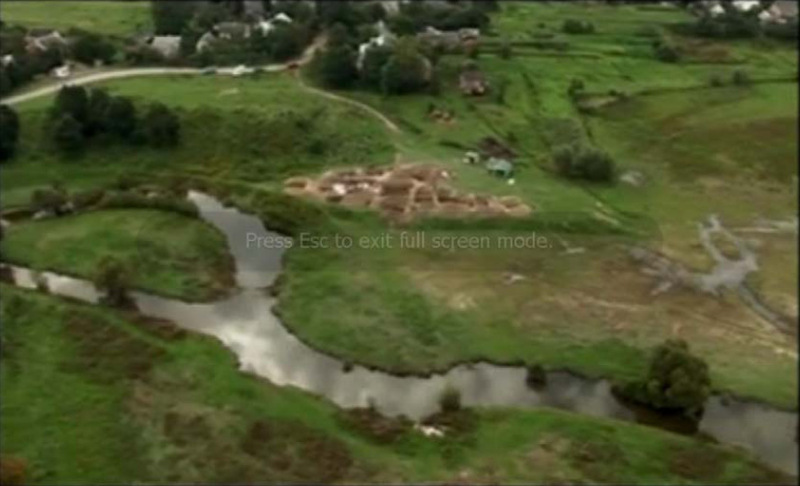 : EK 9/Einsatzgruppe B, subordinated to this Army Group Rear Area) and which confirms that the victims were killed. So it's not like historians have to rely on a trial transcript to reconstruct events in this district. But they can certainly combine the documents, ChGK statements and West German investigations if wished. 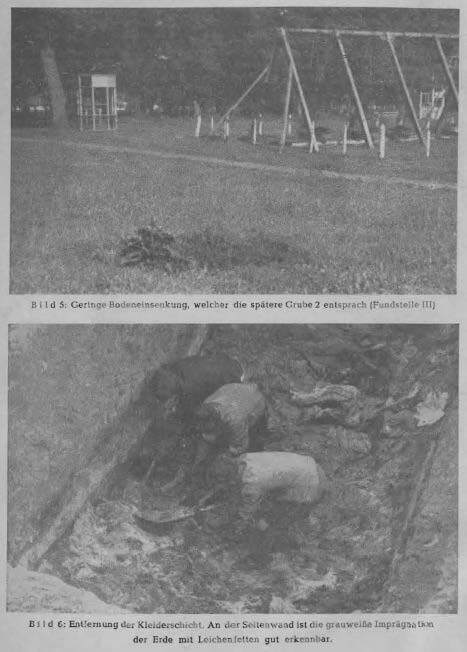 There were 15 ghettos in GebK Glebokie. A trial or trial transcript is no more magical than any other source type (contemporary German official document, photograph, whatever). Sometimes they are available and sometimes they are not. Historians are not lawyers and don't exclude evidence - they use whatever sources are to hand for a particular locality or event, and the confidence of their judgements are naturally elastic, because of the obviously varying quantities and qualities of evidence available for different eras and locations. I always thought it odd that no Nazi was outraged by the alleged atrocities that he didn’t take pictures with a tiny Minox spy camera or confess to a priest or psychiatrist. After the war they were intimidated to keep quiet. Intimidated by whom exactly, and what's the evidence that they were? Besides, you apparently didn't look before writing. The pictures I showed at the beginning of this article were obviously taken by direct observers of the "alleged" atrocities. And there are others of the sort. As to "confessions", there were many. This guy, for instance, wrote to his wife about his sporting activities. This one expressed concern about certain procedures. These guys and these here talked freely among themselves about certain nice things. And so on. I guess you'll have to yell "forgery". Here you can start listening to a very "intimidated" fellow. "I learnt from a member of the commando that the patients had been gassed. He had approached me as doctor, because he became crazy. He told me that he is hearing the sound of the gas all the time. It was the person who closed and opened the gas valve." Another thing, what would those "intimidators" have expected the "intimidated" to "keep quiet" about?